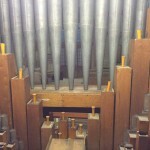 To overhaul the entire organ and renew the mechanism to first-class standards. 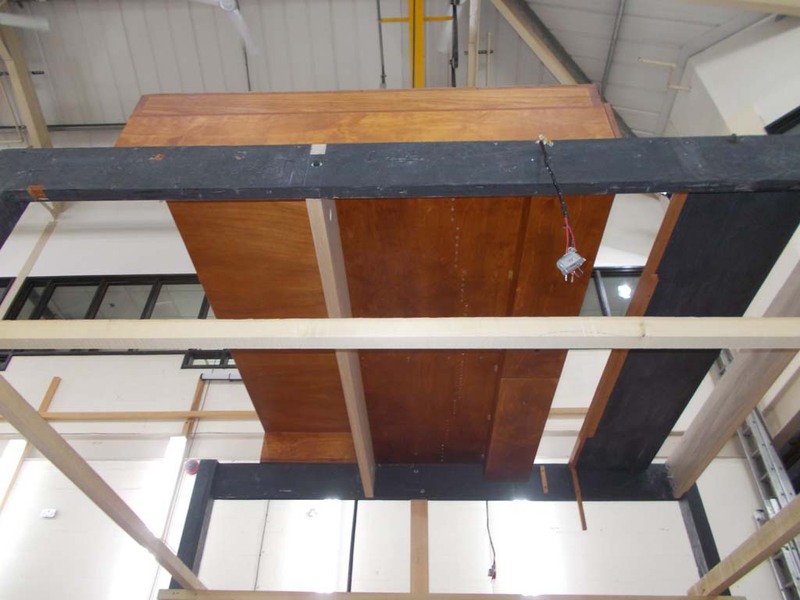 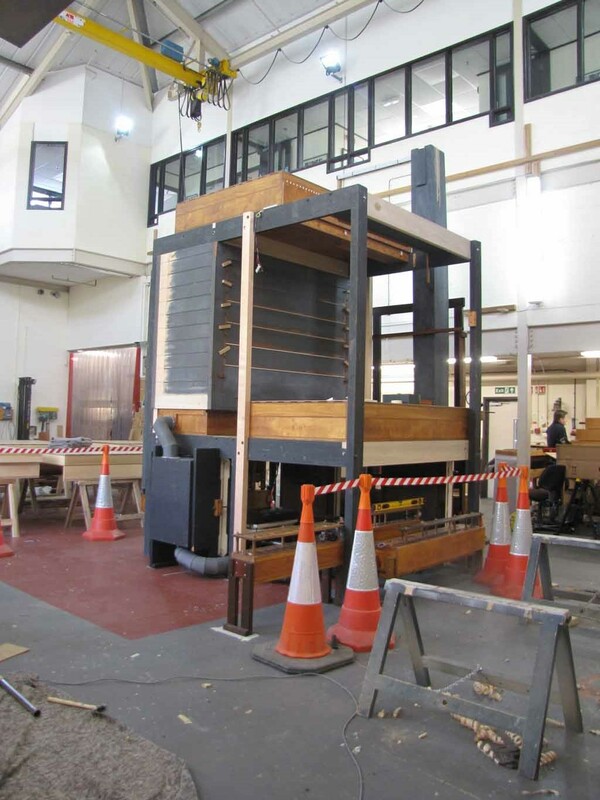 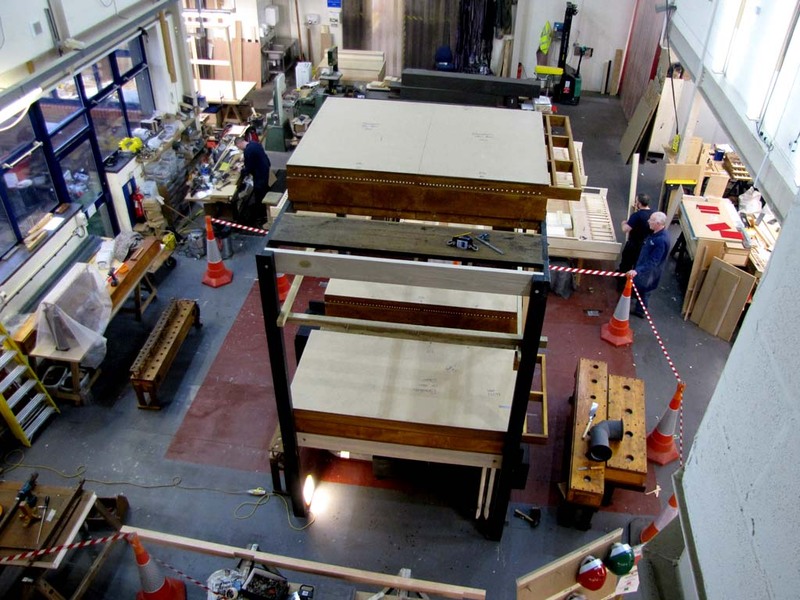 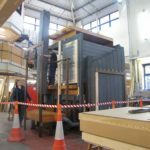 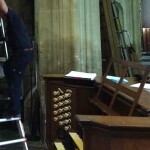 The instrument will also be re-sited and the console made mobile. 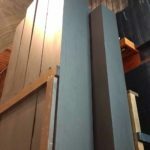 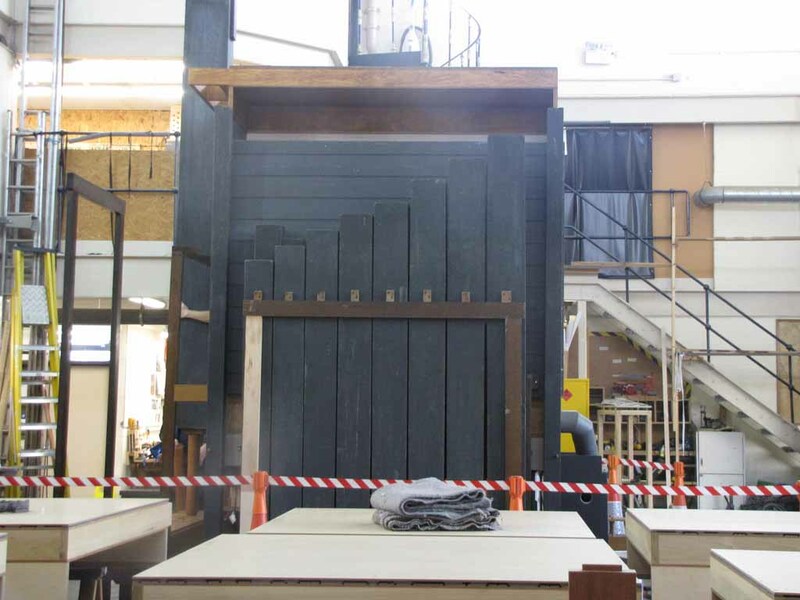 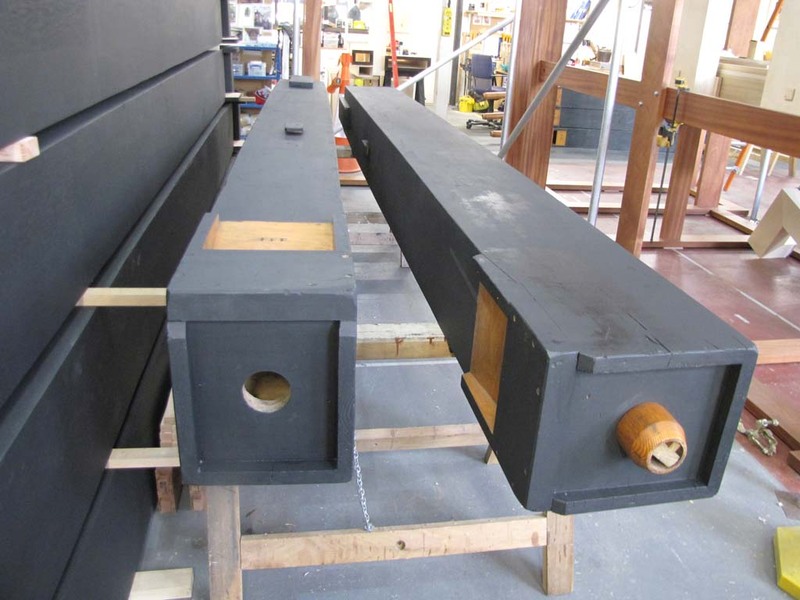 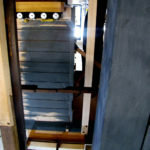 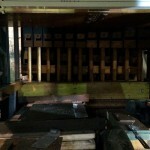 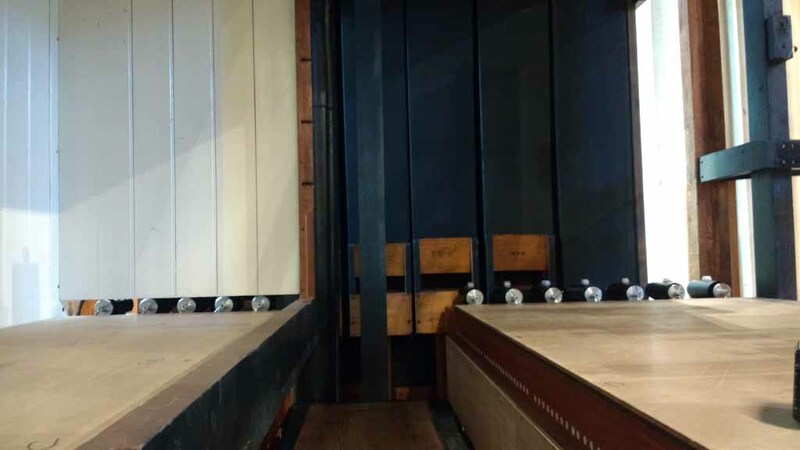 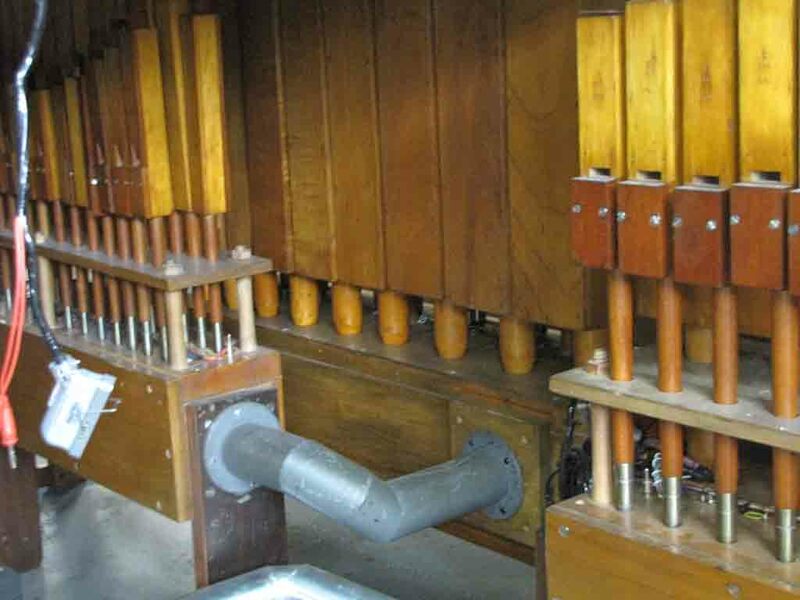 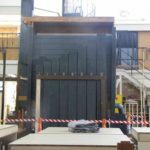 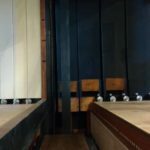 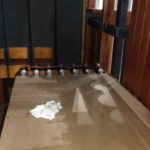 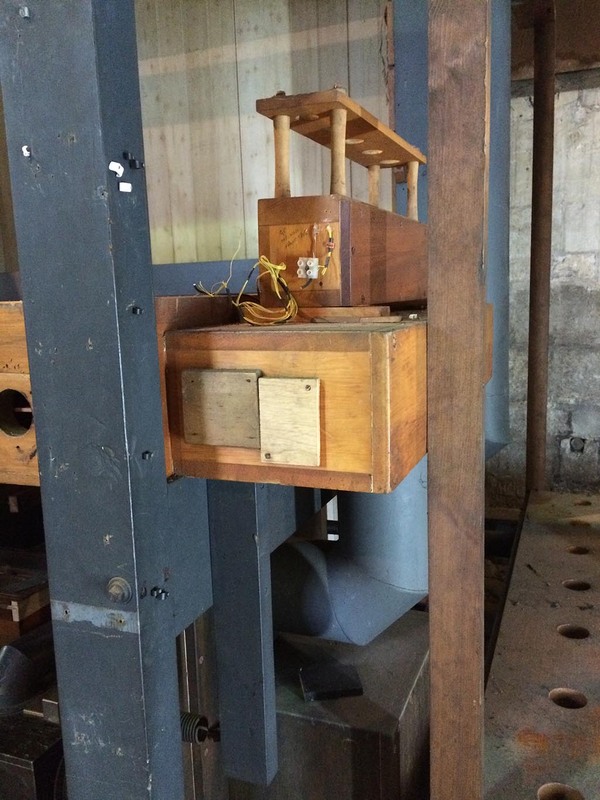 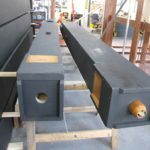 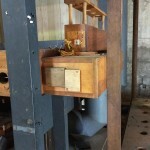 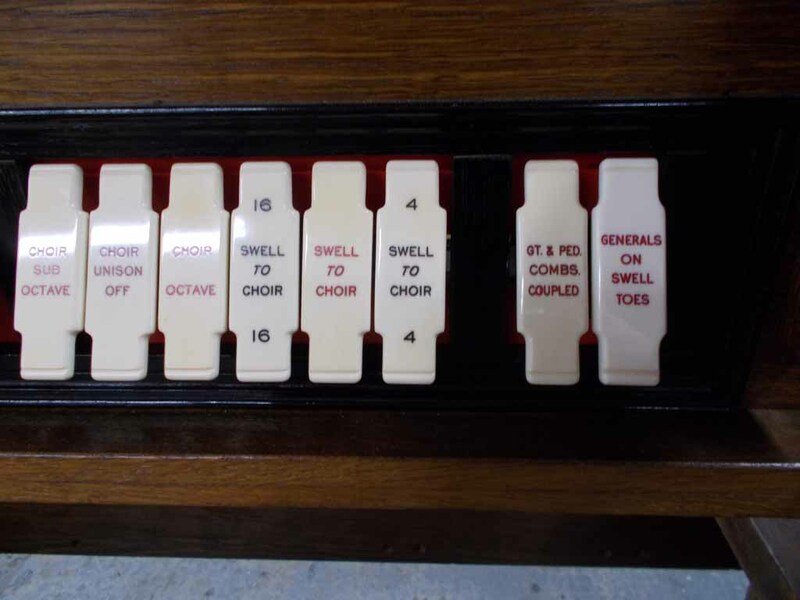 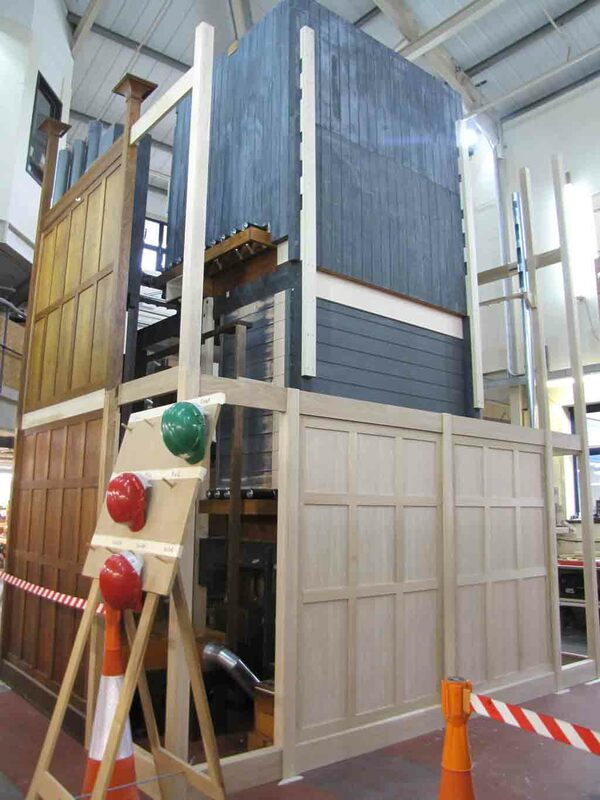 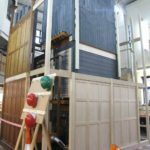 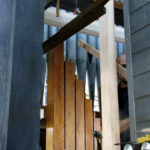 The Swell, Great and Choir wind chests will all be replaced with new slider soundboards and electro-pneumatic actions. 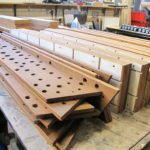 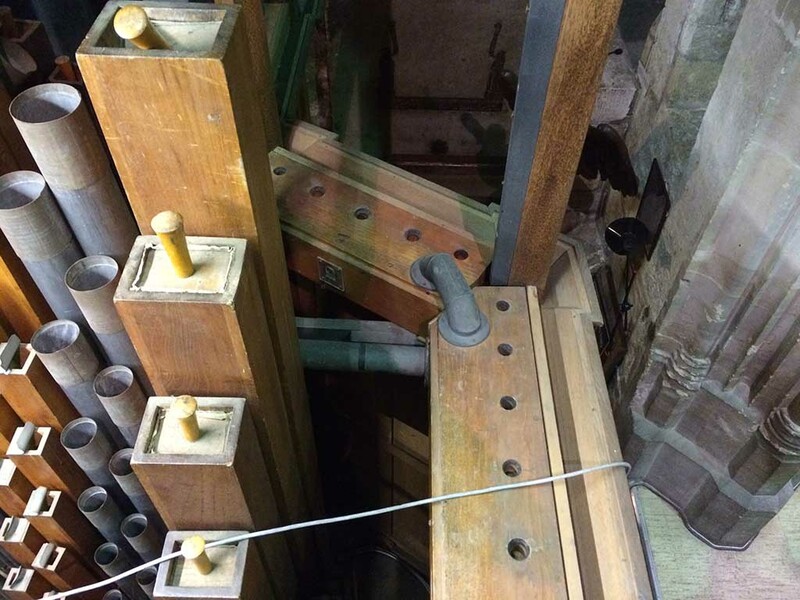 The individual chests for Pedal stops and off-notes will be overhauled. 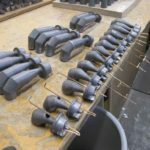 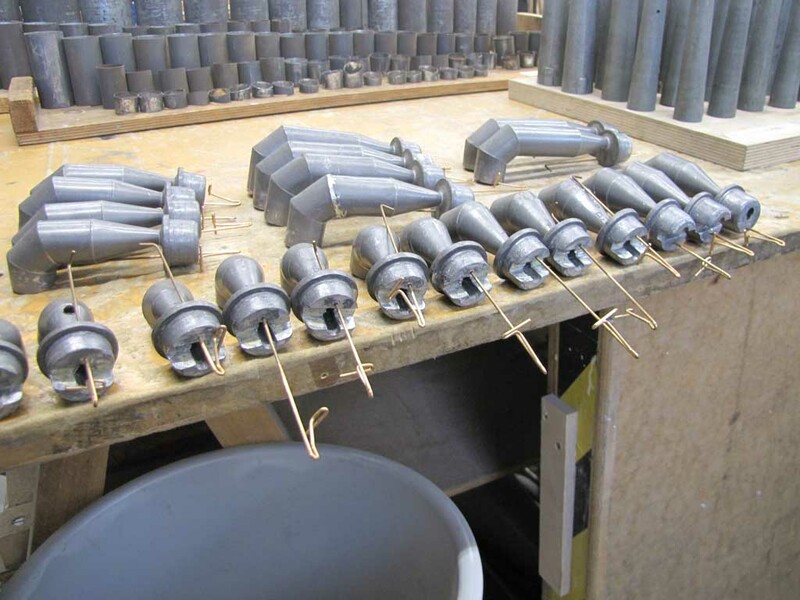 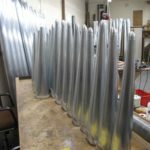 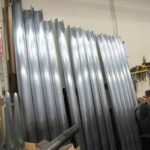 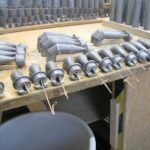 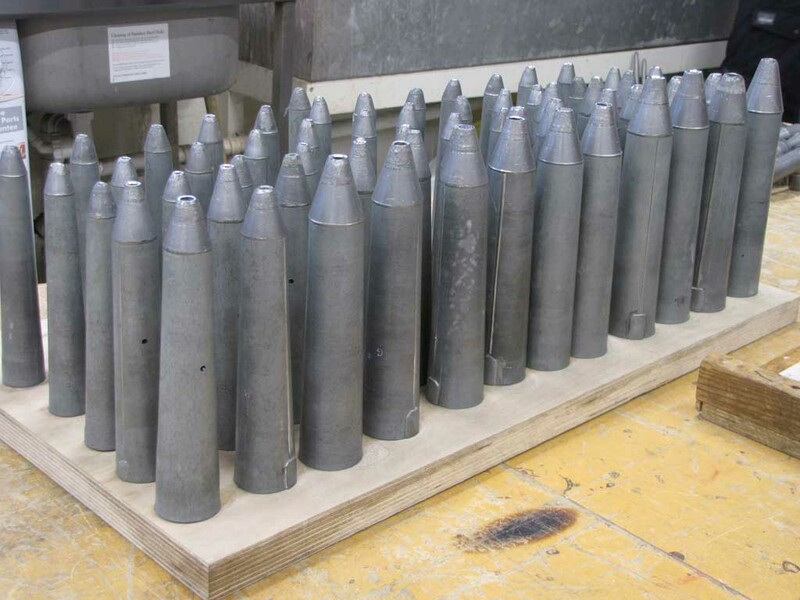 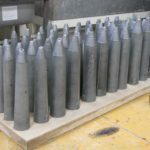 All of the bellows will be re-leathered, along with the original tremulants. 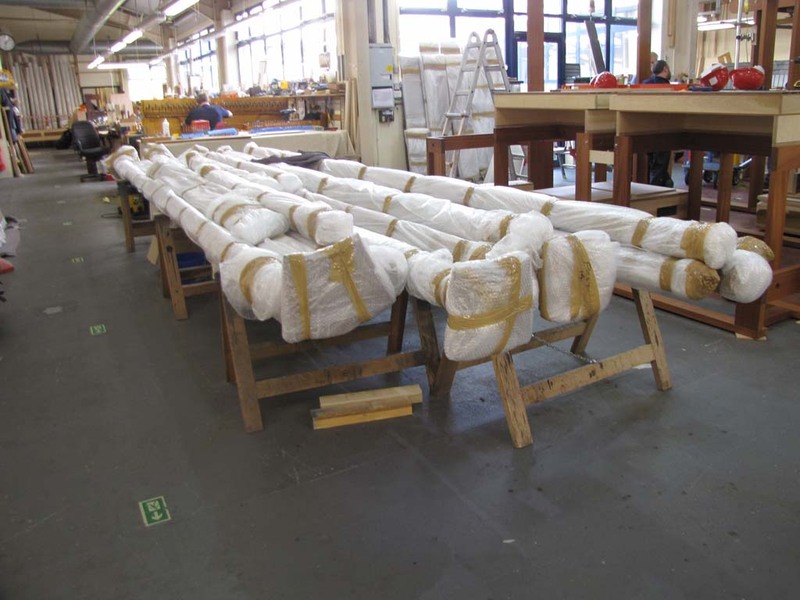 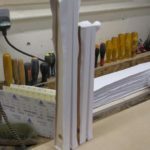 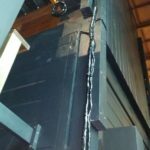 The wind trunking will be re-bedded. 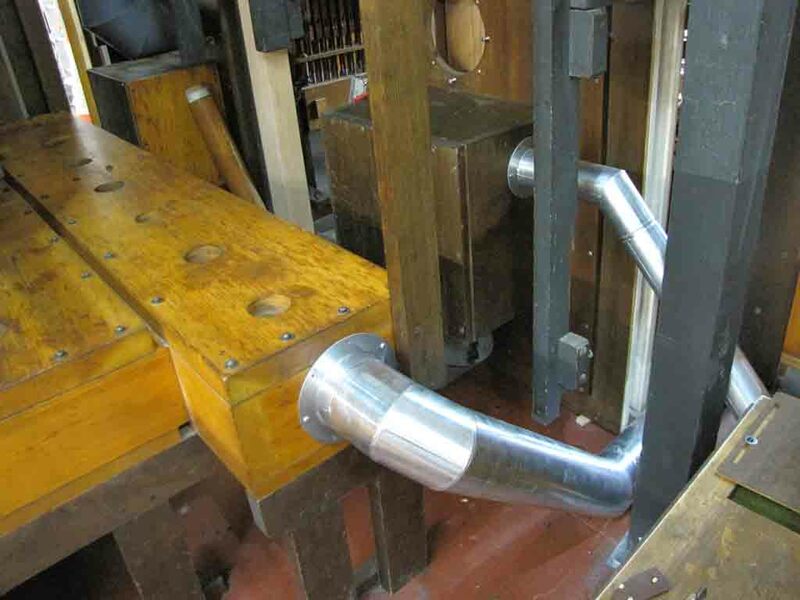 Re-leather single-rise bellows. 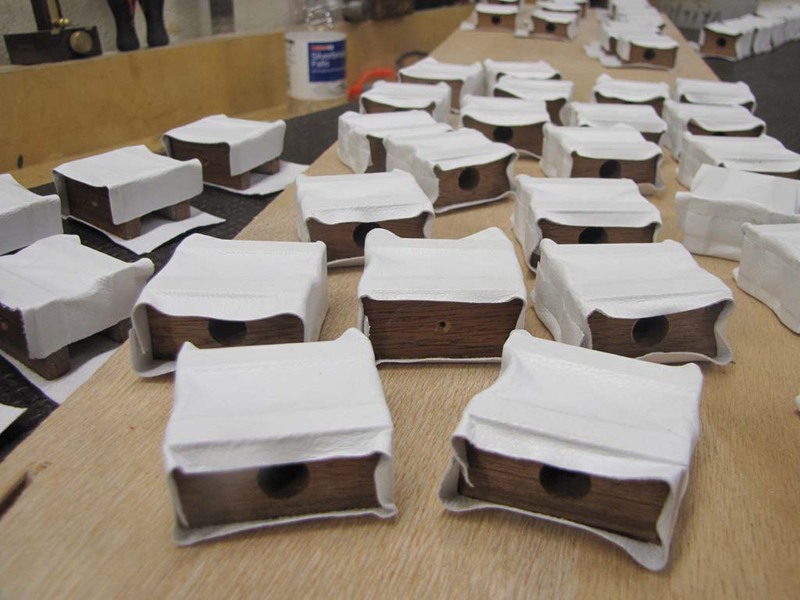 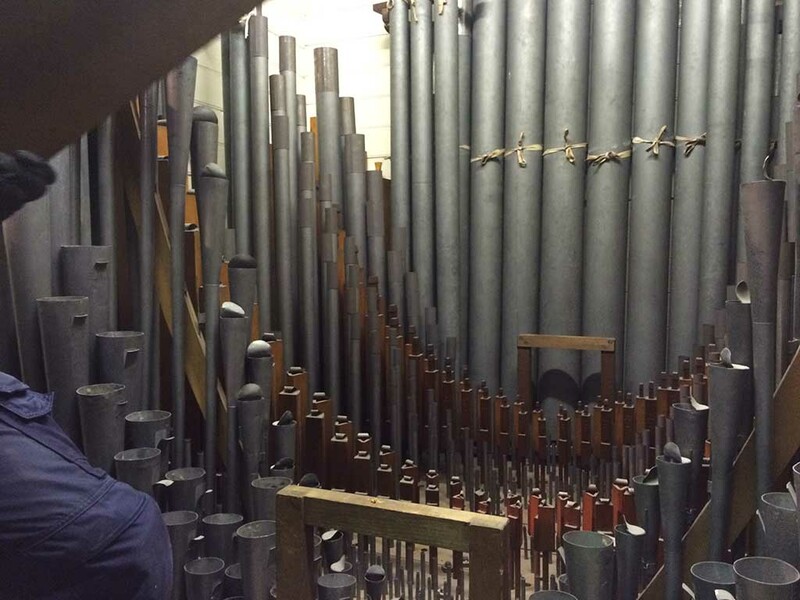 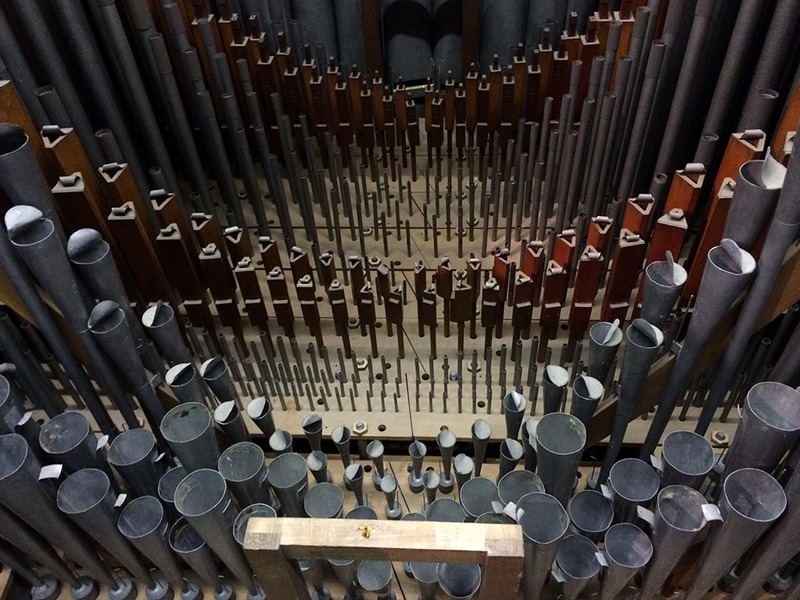 All the pipes will be cleaned, the reed stops brought to the workshop for our Voicer’s attention. 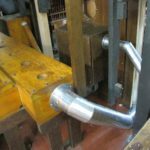 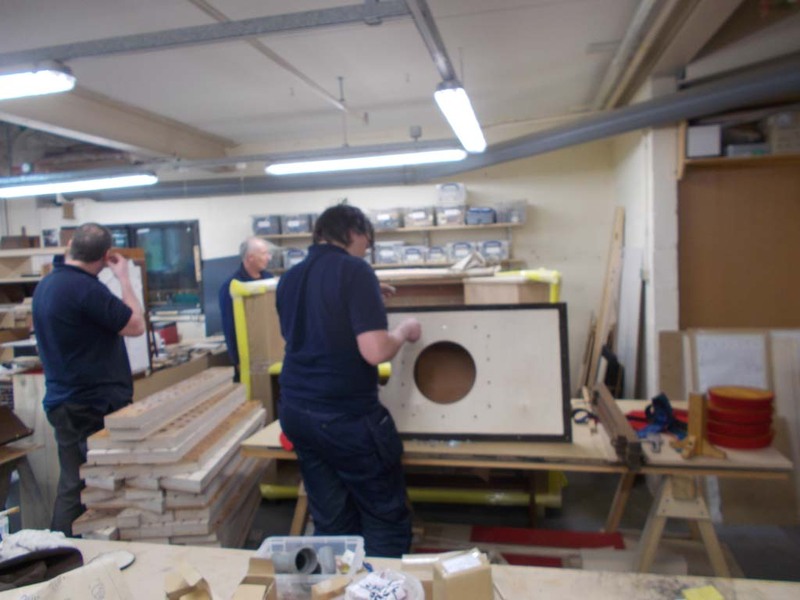 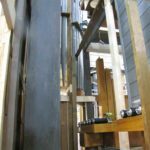 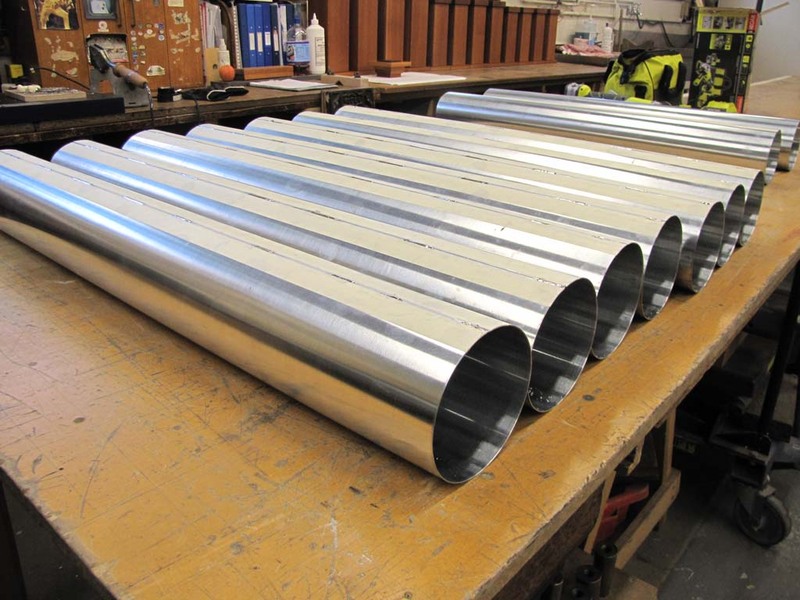 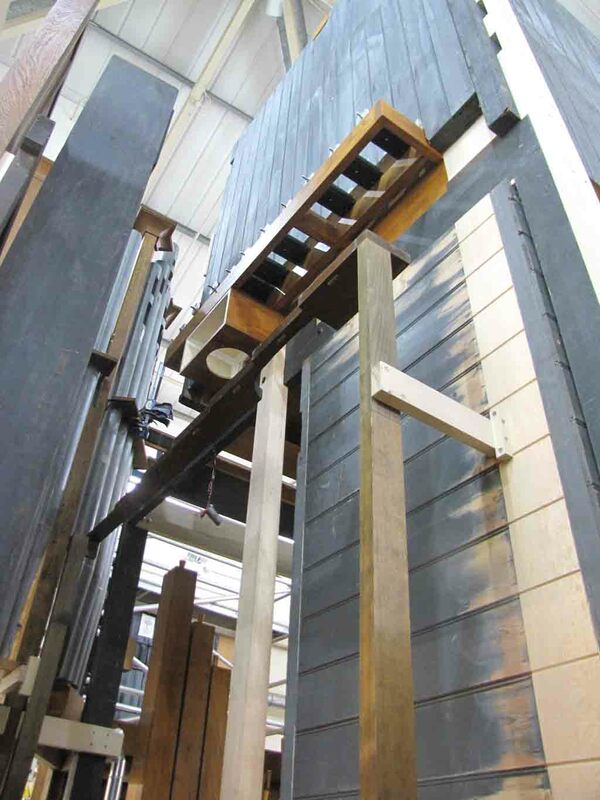 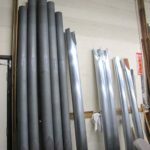 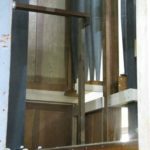 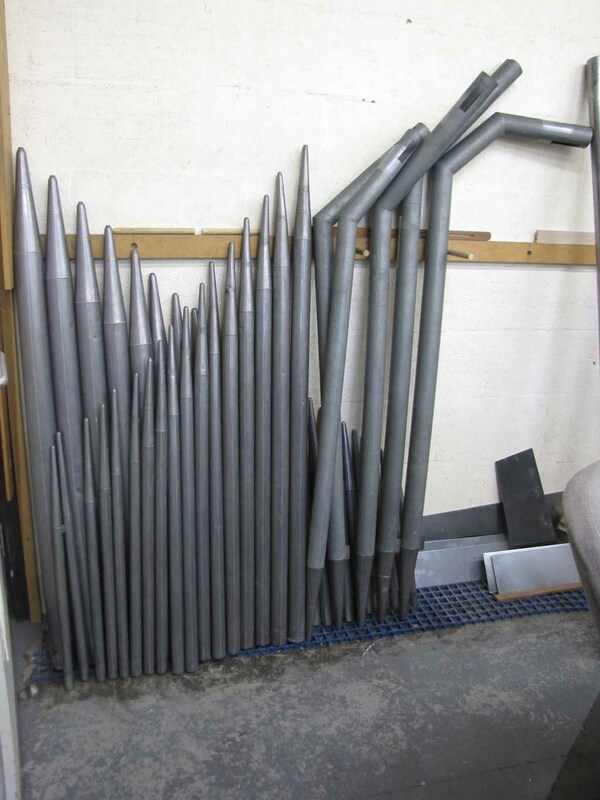 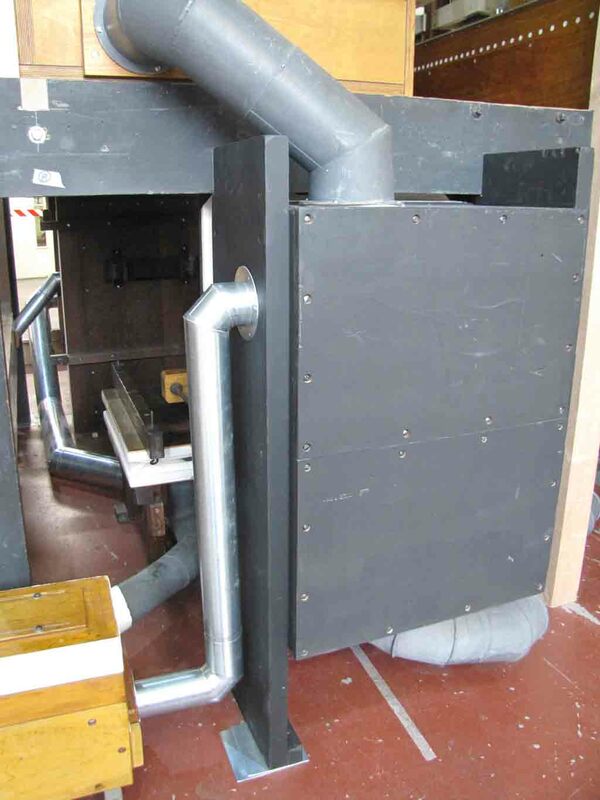 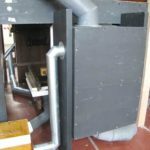 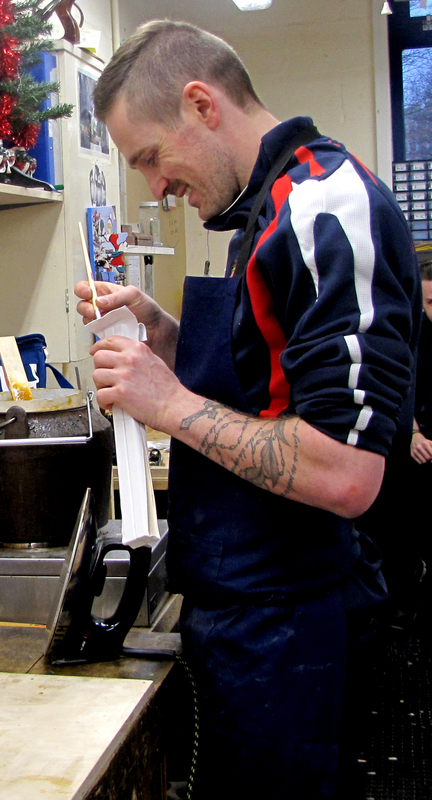 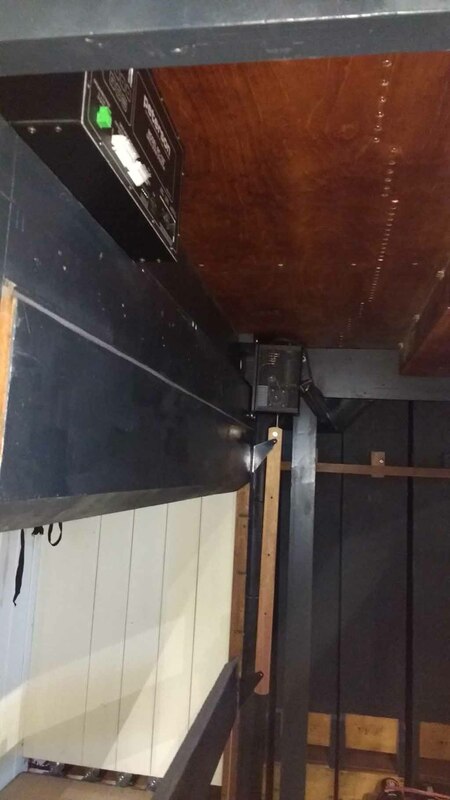 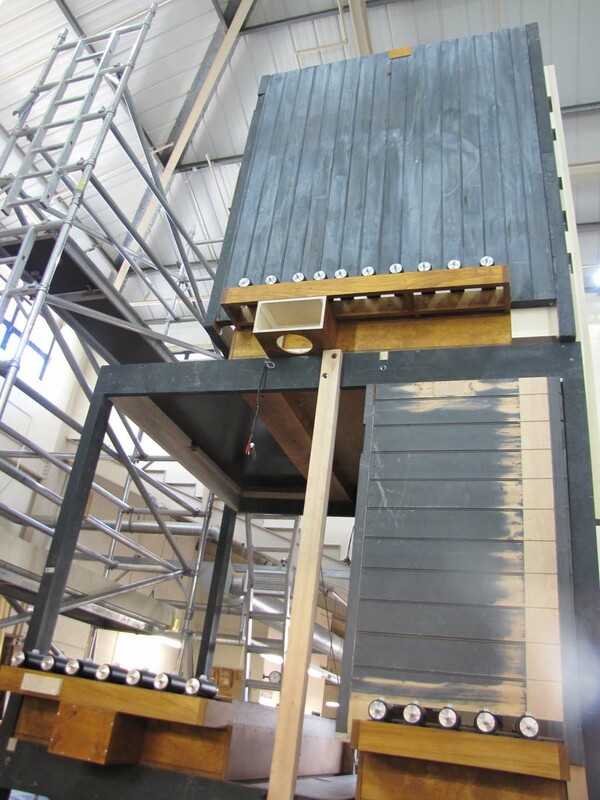 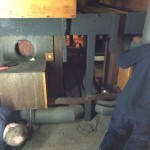 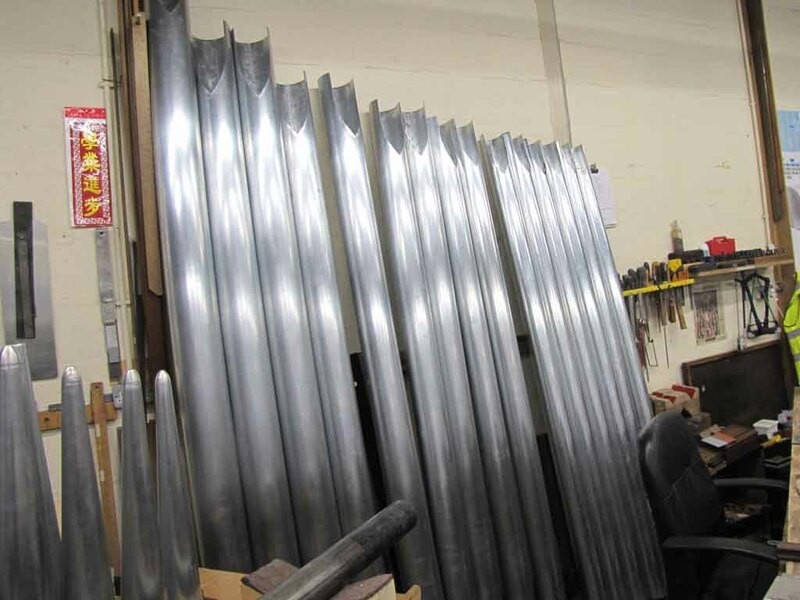 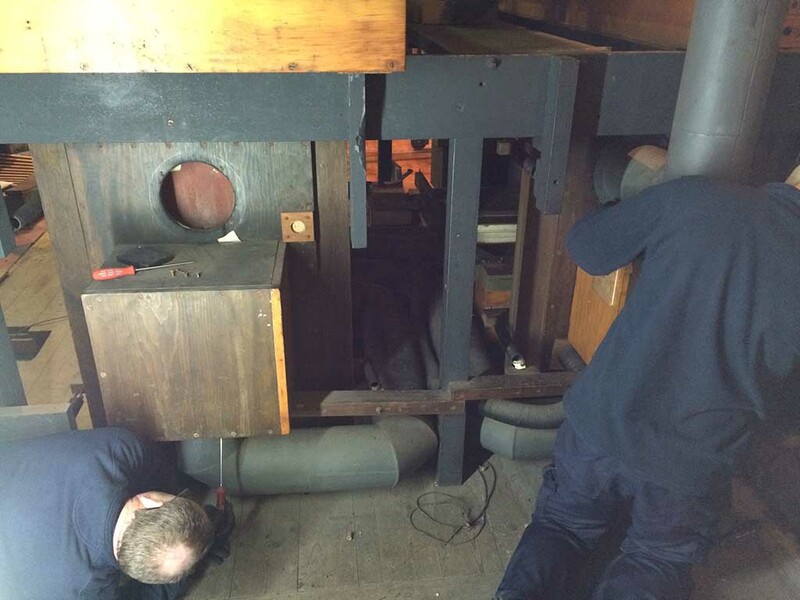 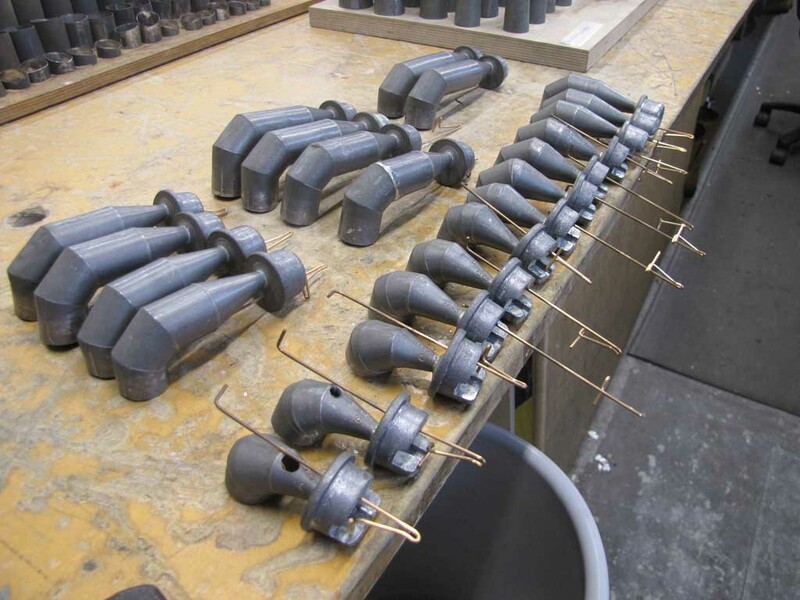 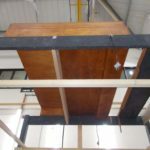 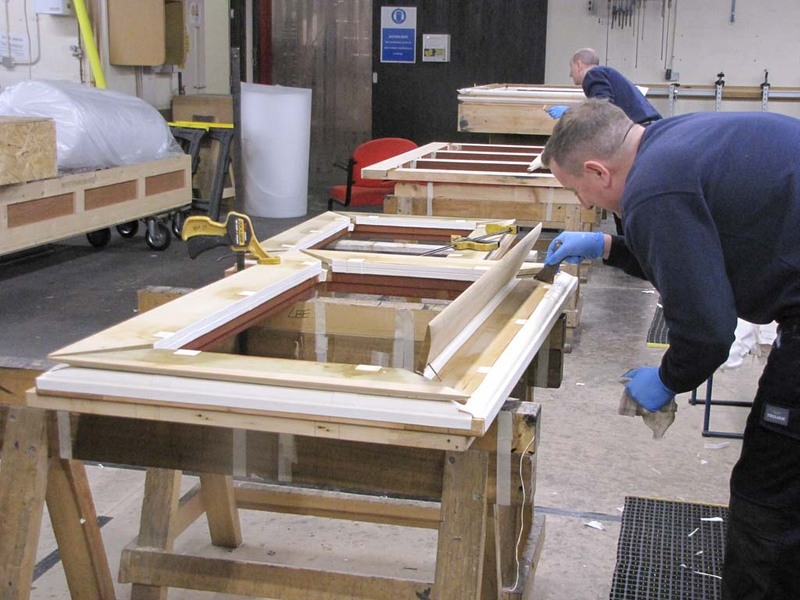 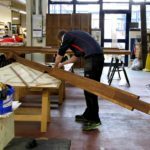 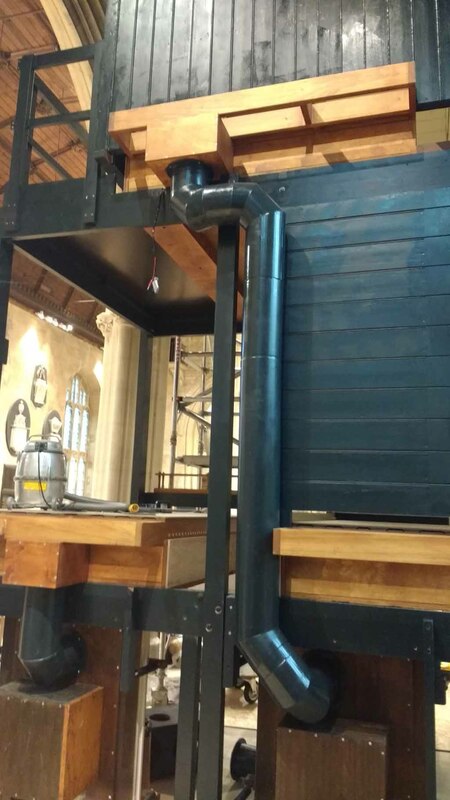 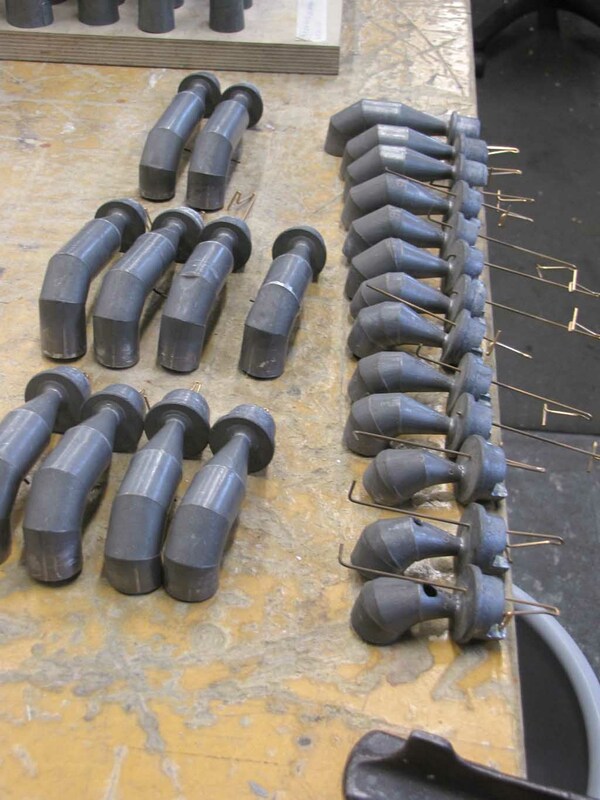 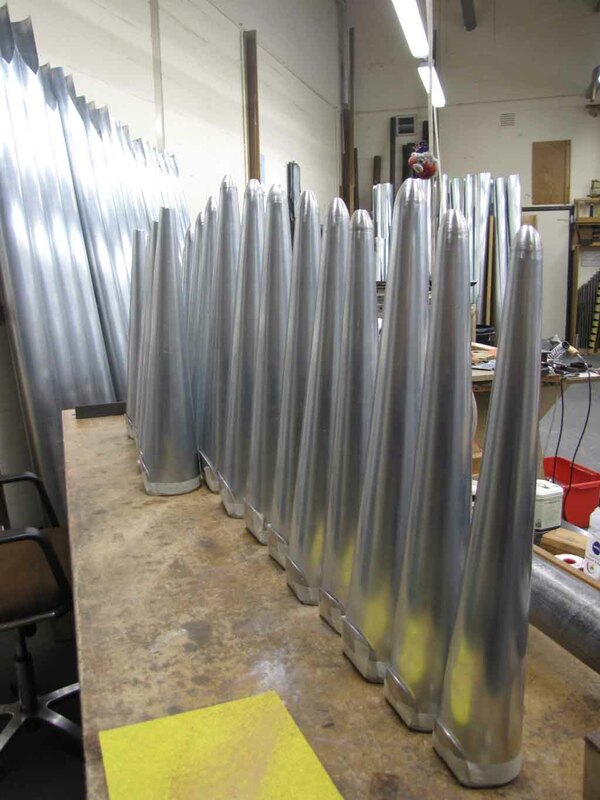 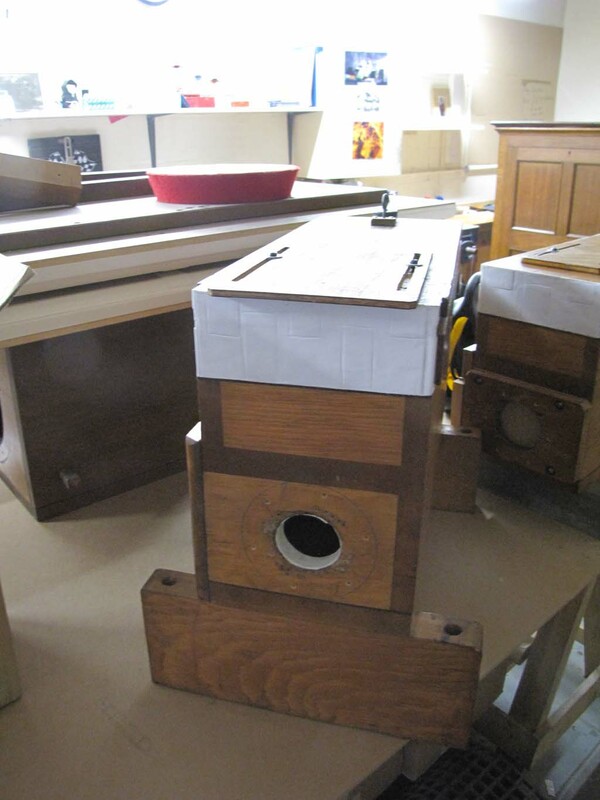 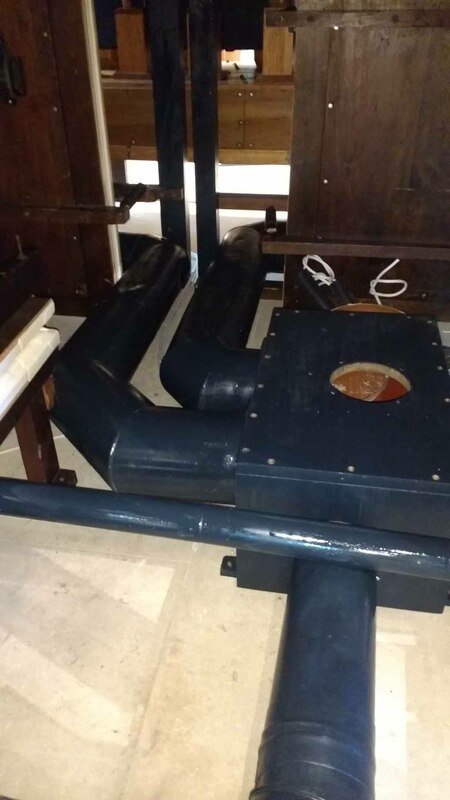 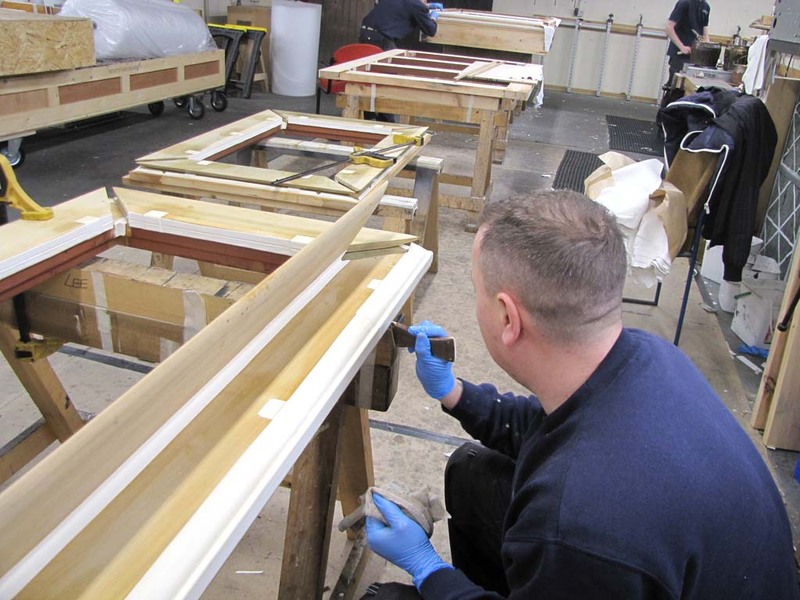 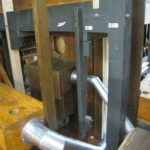 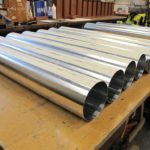 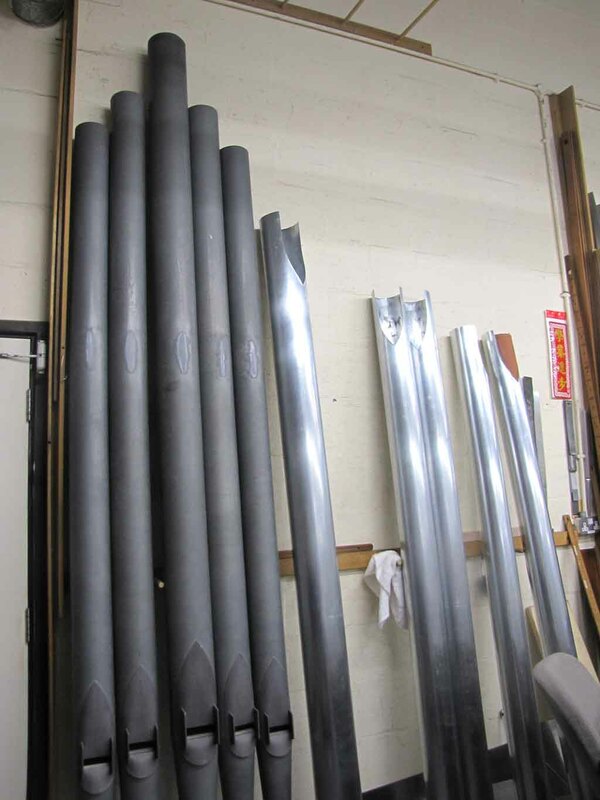 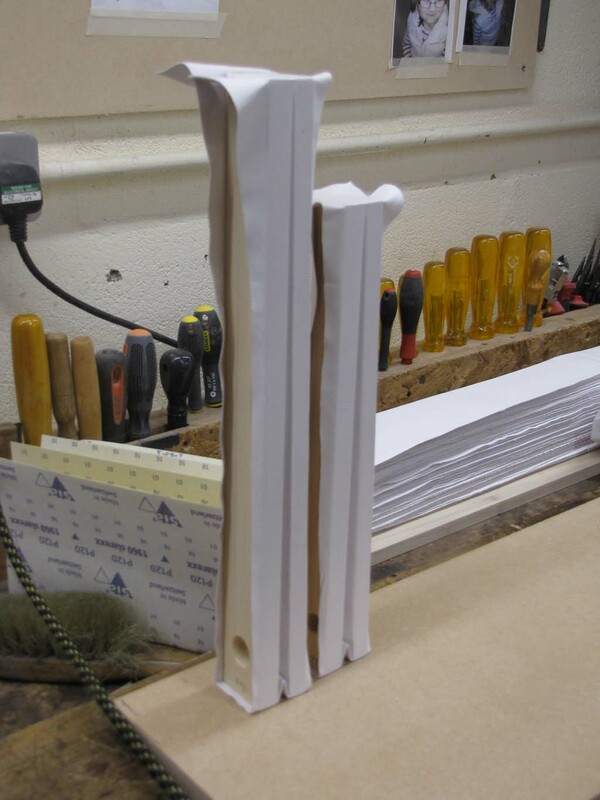 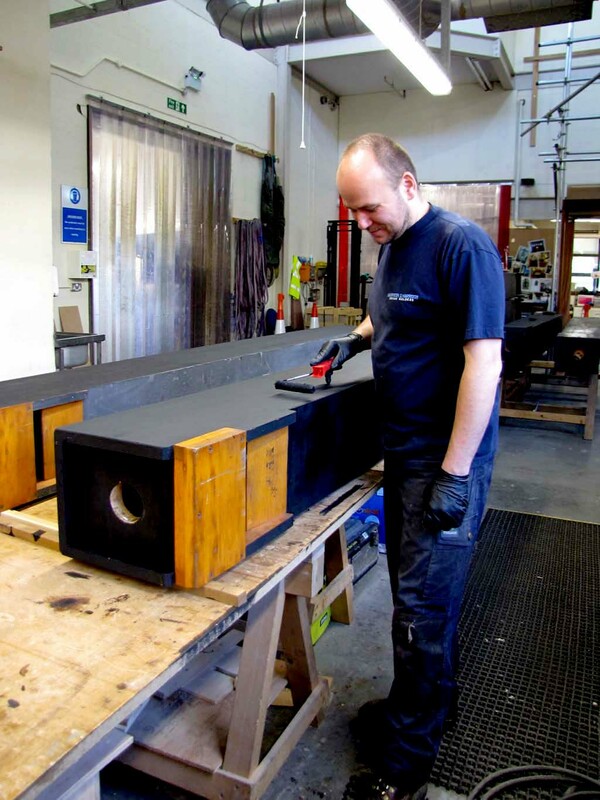 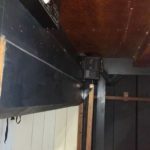 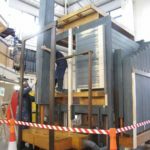 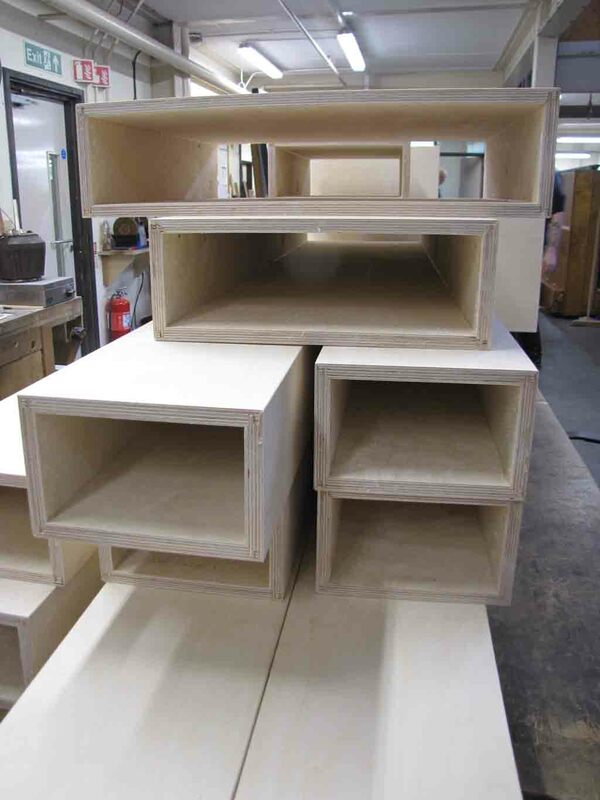 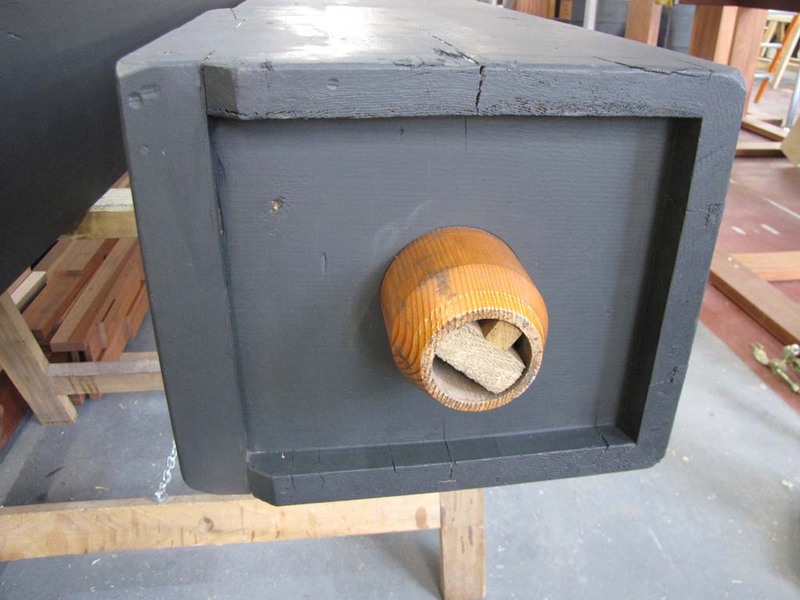 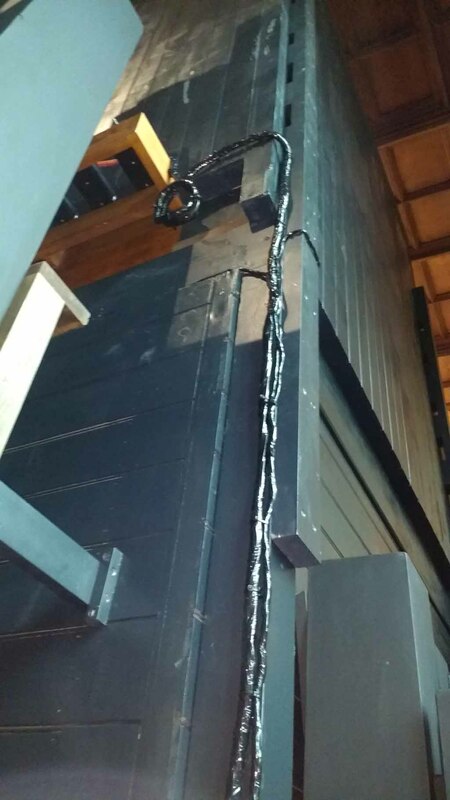 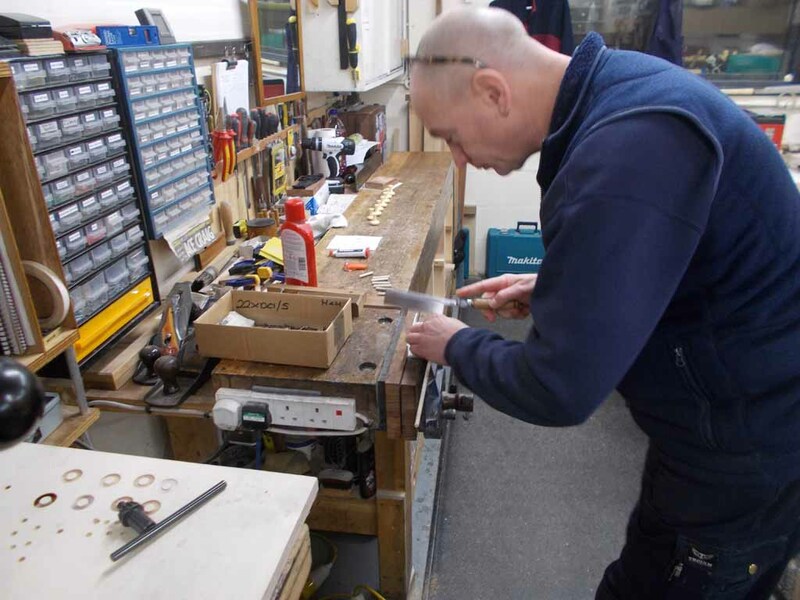 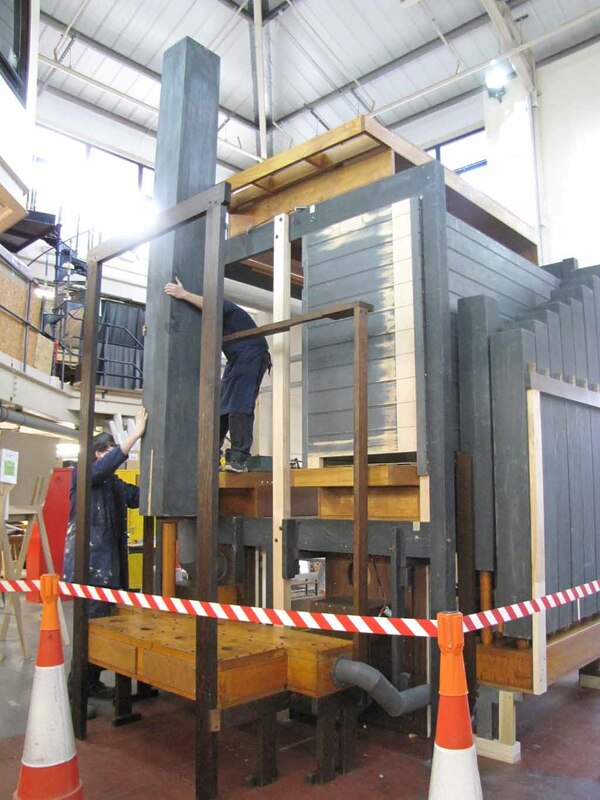 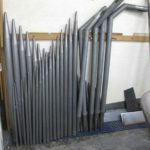 We will fit tuning slides on Flue pipes where they are missing, in order to protect the pipes from future damage. 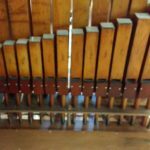 Changes to the Pedal “Octave Flute” 4ft. 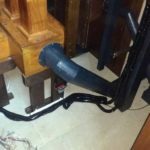 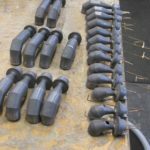 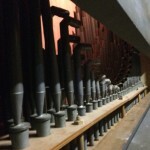 After the work is completed we will regulate all of the pipework in order to reinstate the speech and balance of 1926. 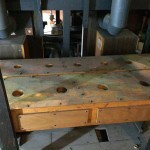 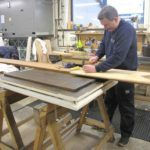 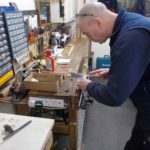 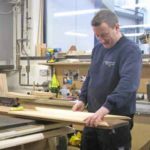 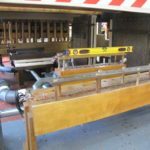 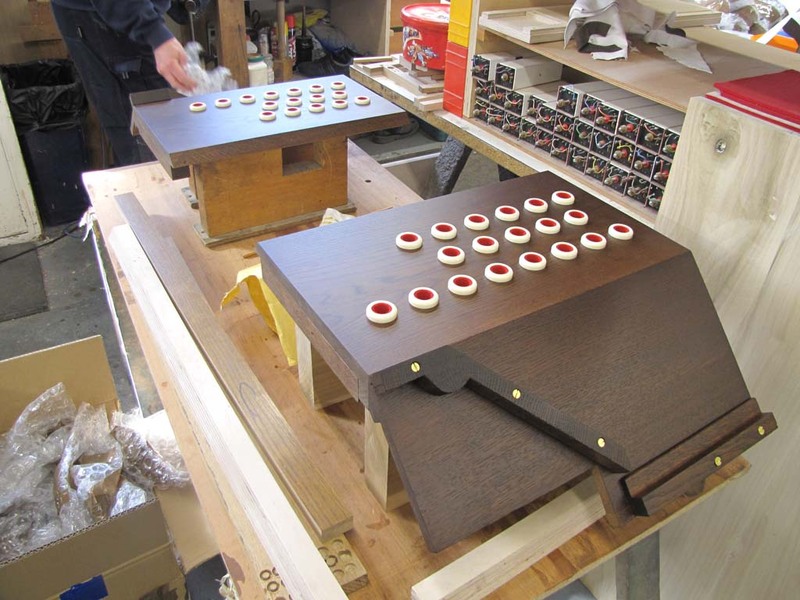 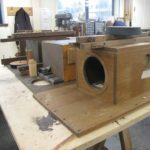 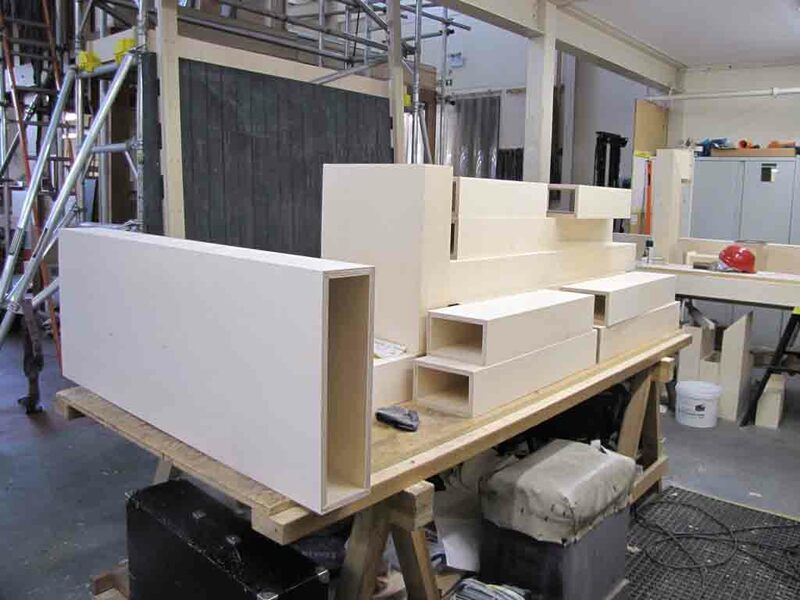 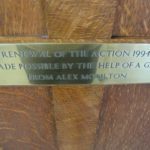 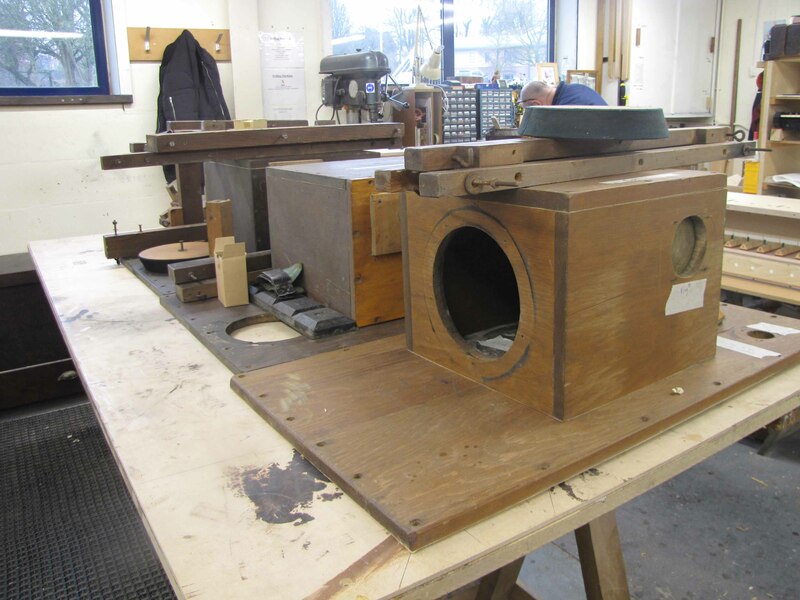 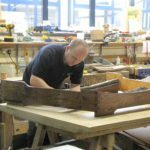 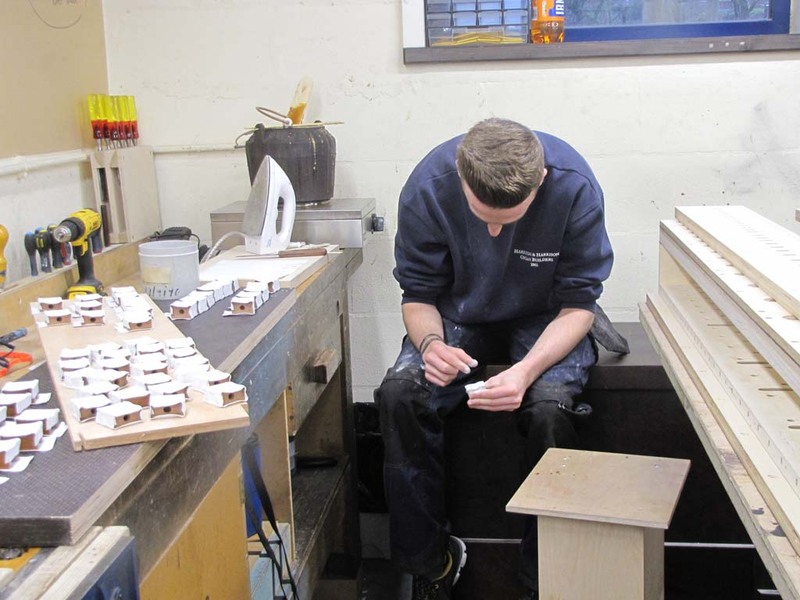 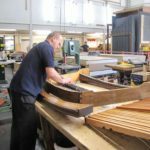 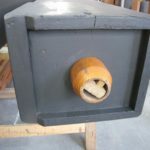 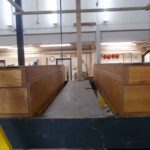 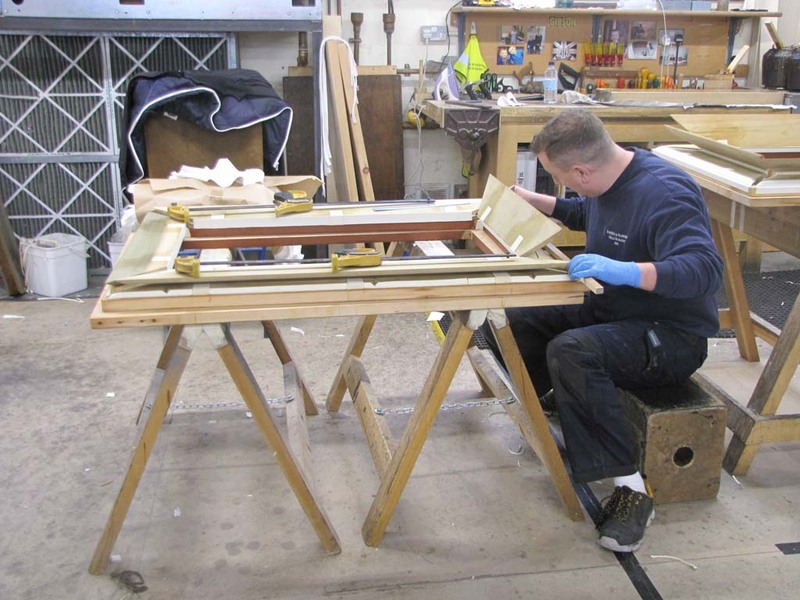 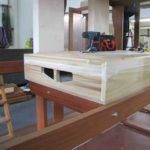 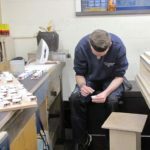 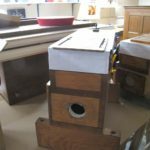 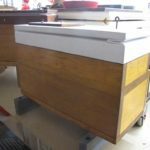 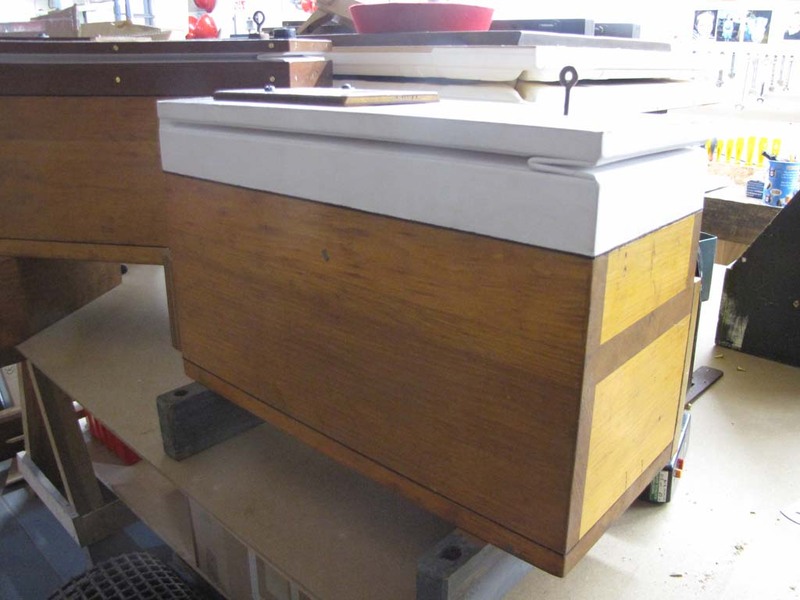 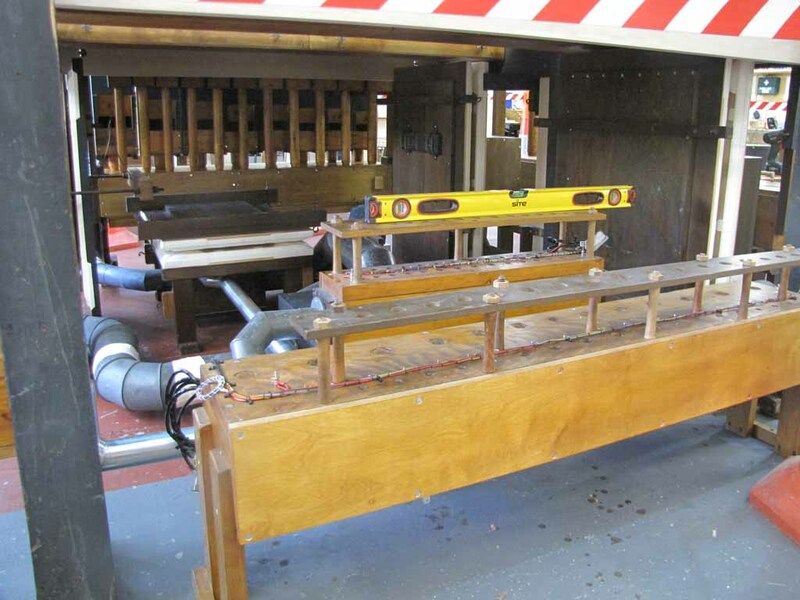 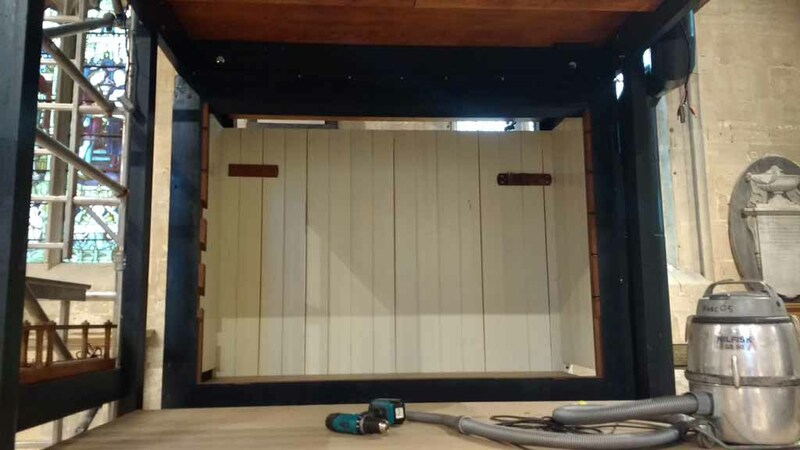 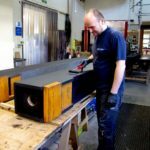 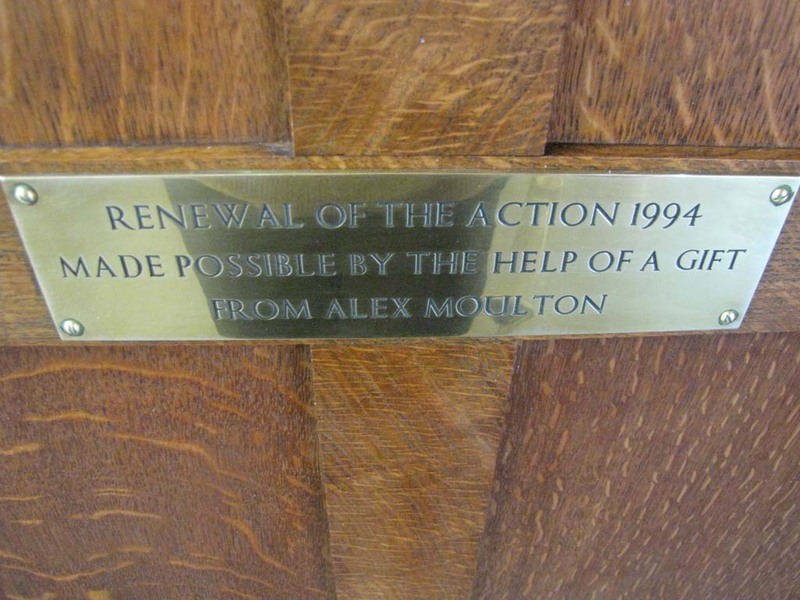 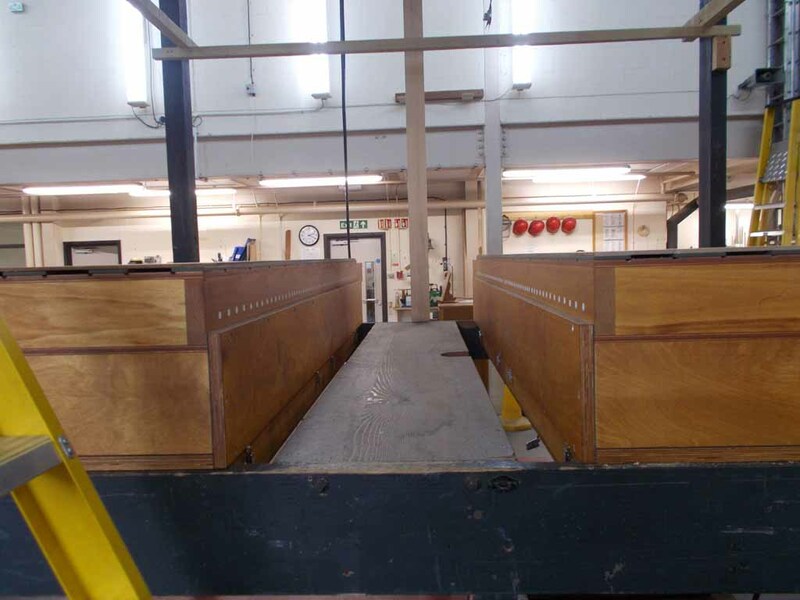 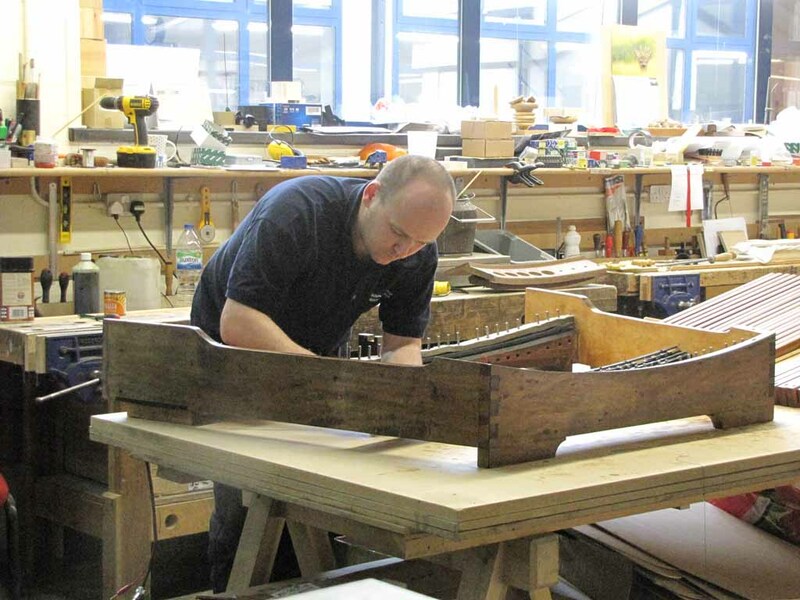 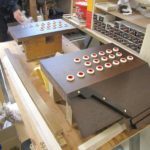 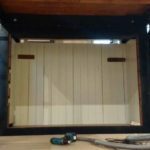 Console is to be refurbished and new adjustable bench manufactured. 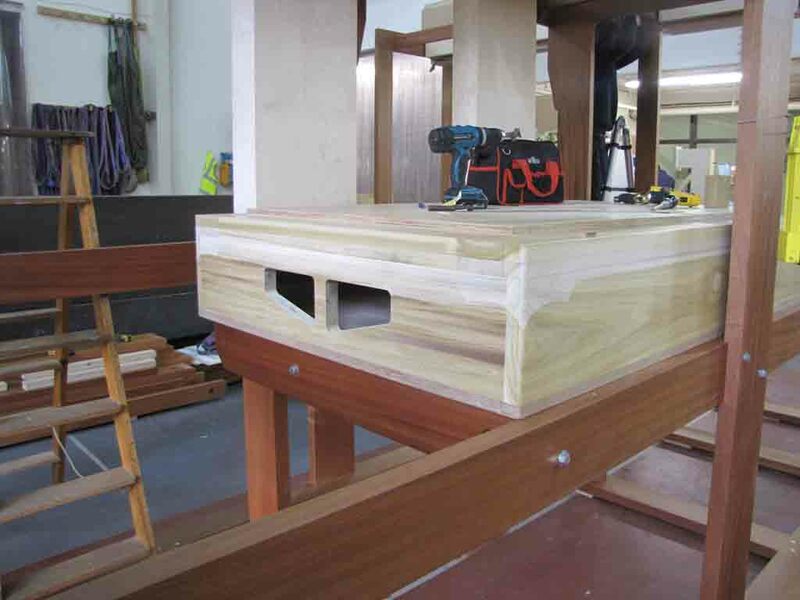 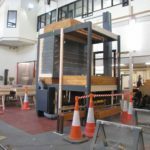 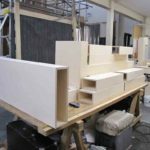 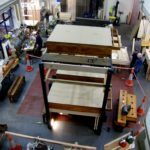 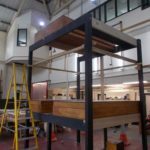 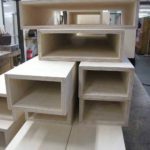 New mobile console platform to be made. 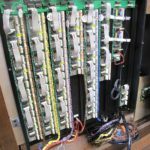 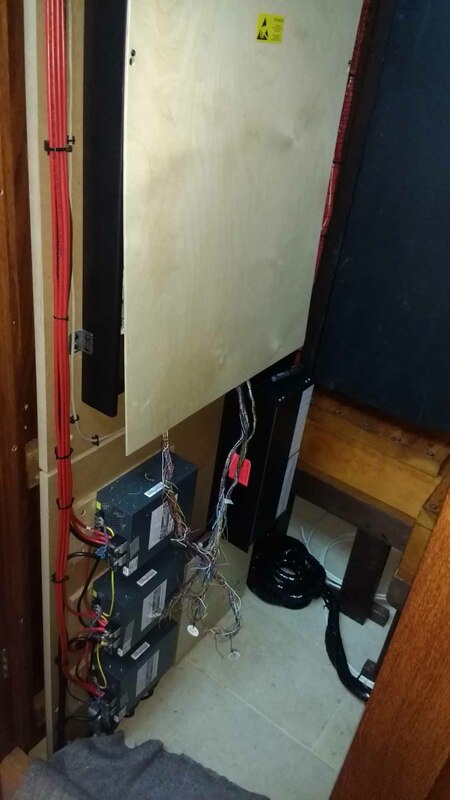 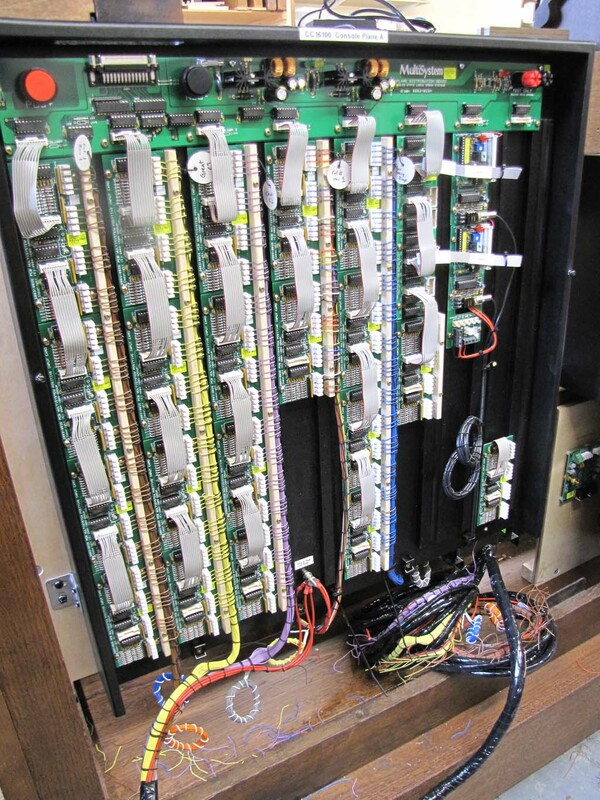 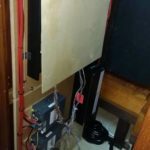 New electrical system installed for compatibility with the new electro-pneumatic actions. 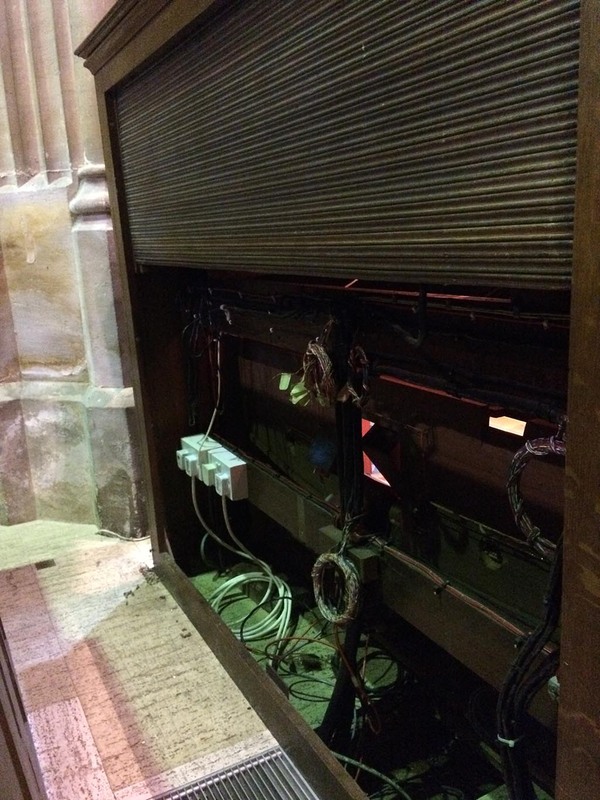 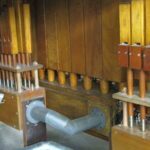 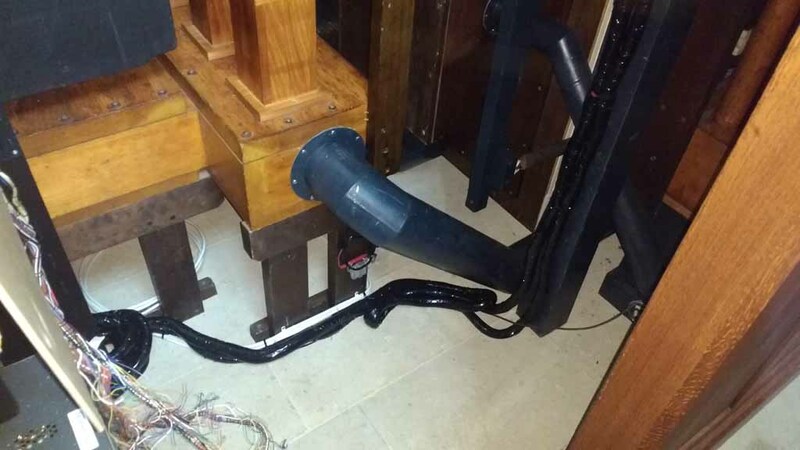 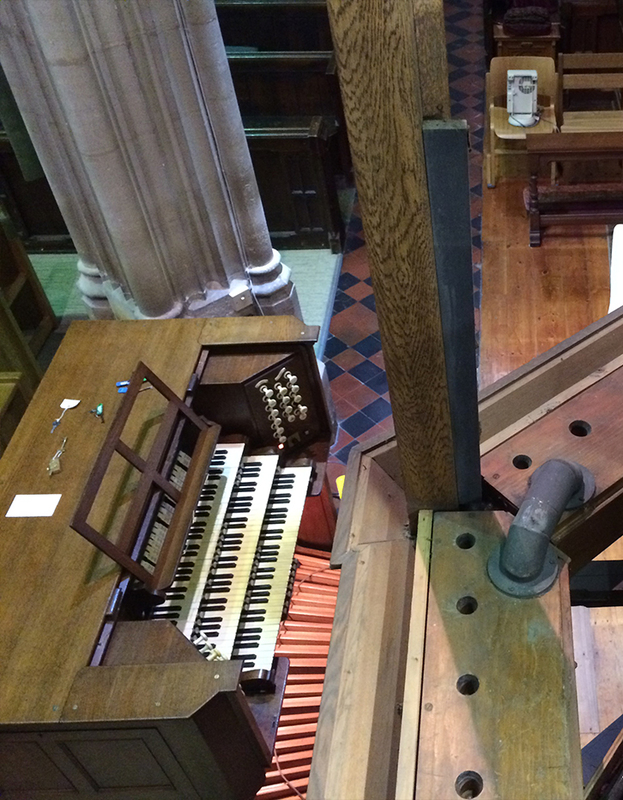 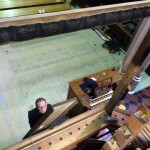 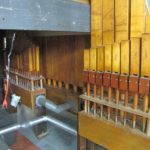 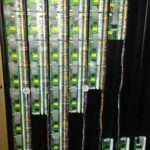 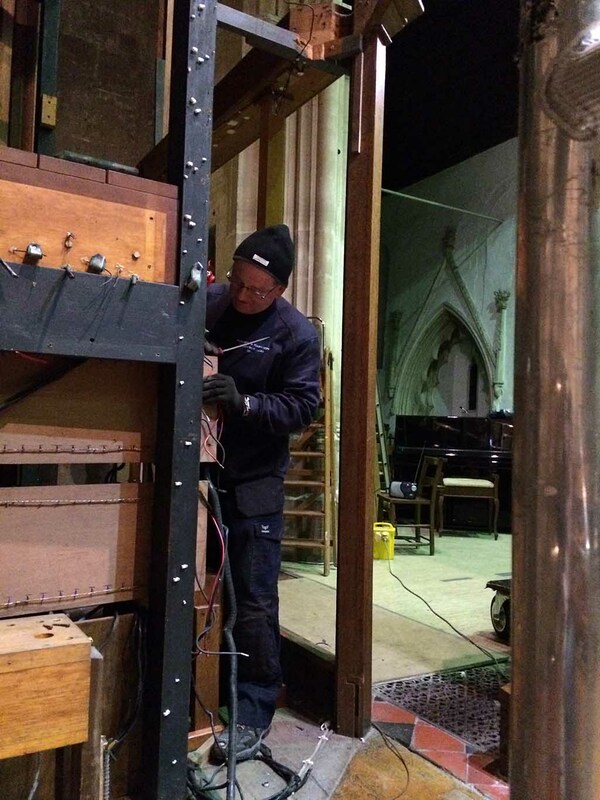 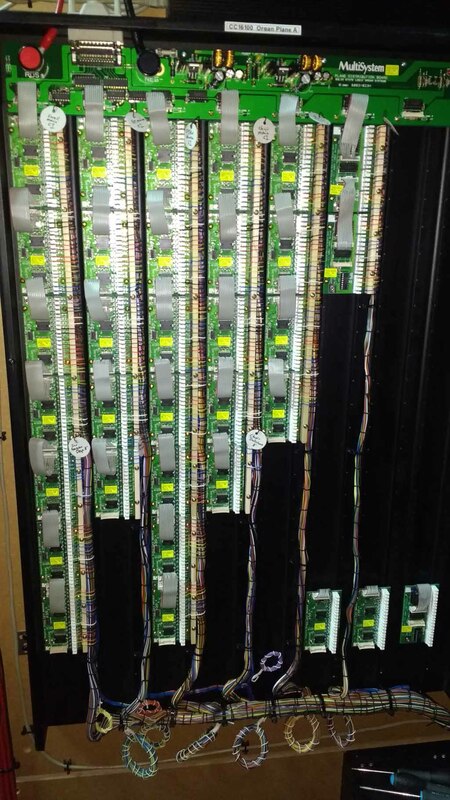 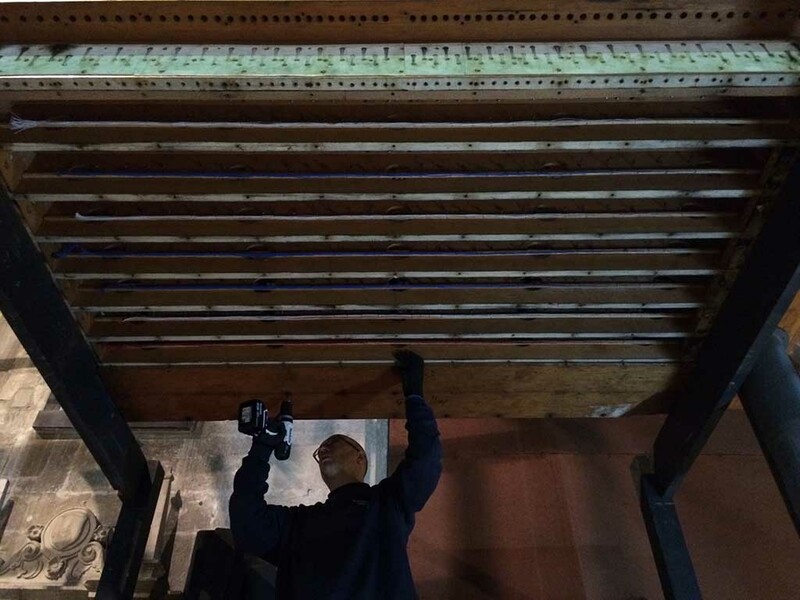 New low-voltage cabling will be provided throughout the organ. 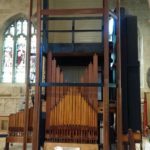 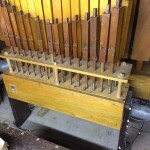 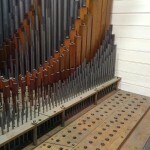 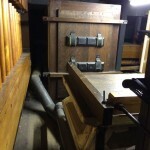 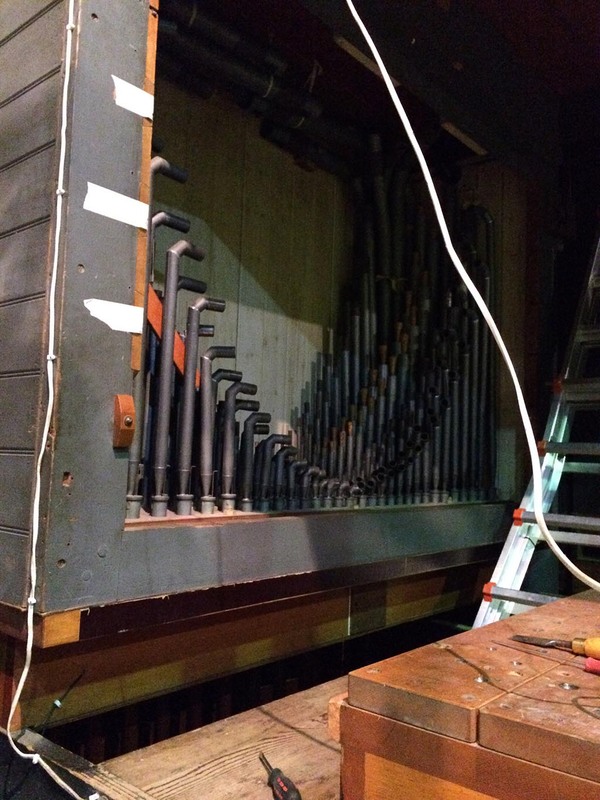 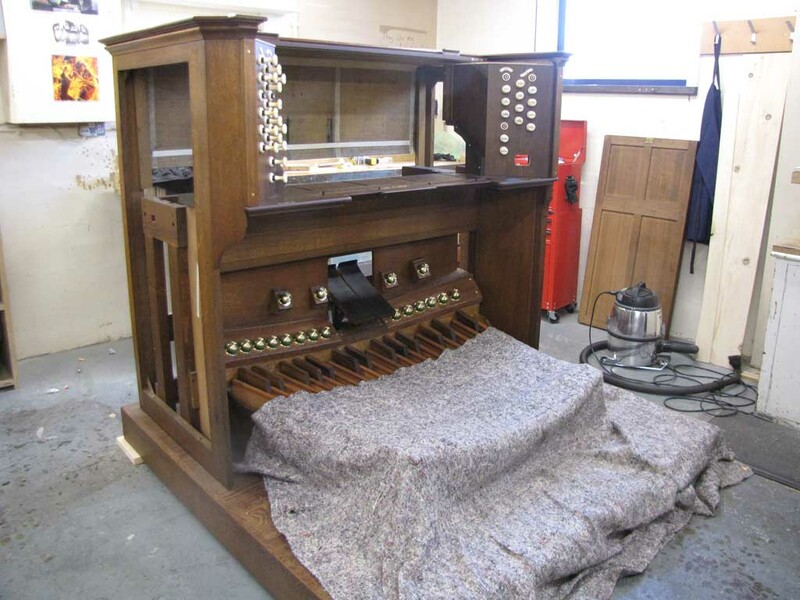 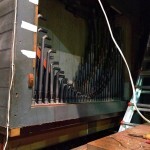 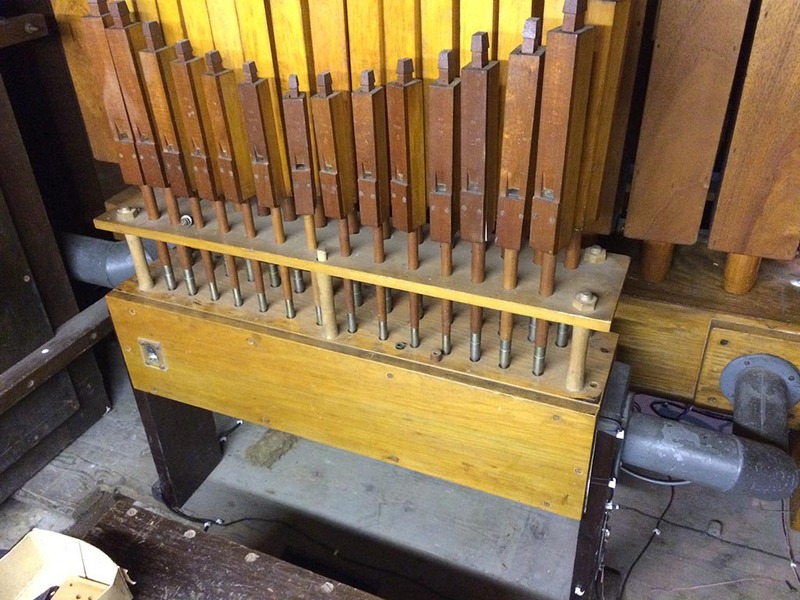 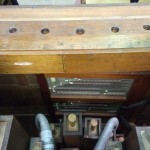 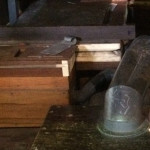 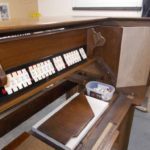 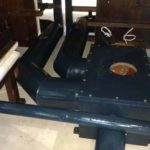 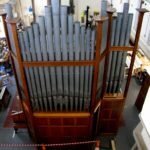 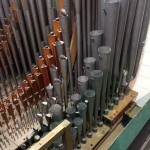 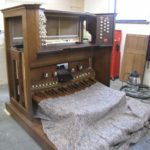 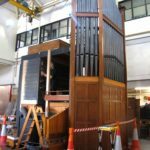 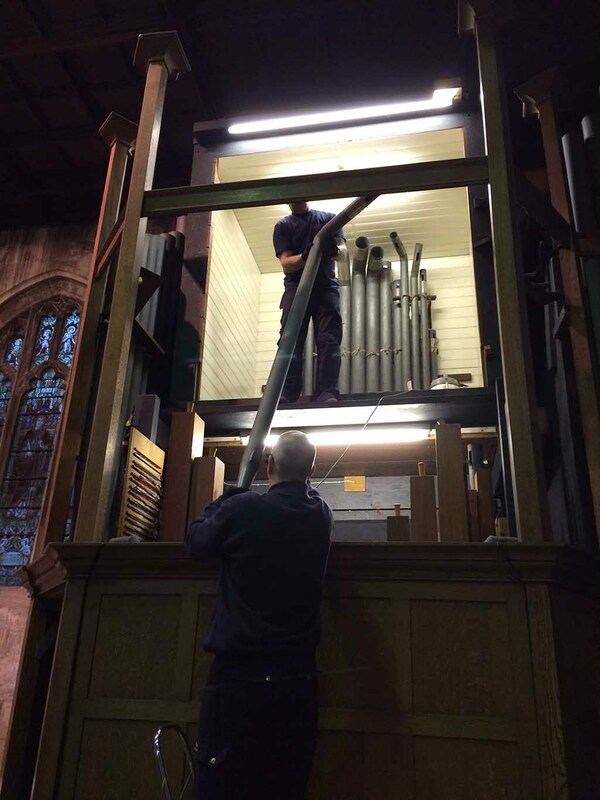 The organ and case will be cleaned. 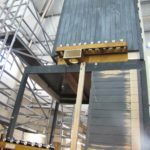 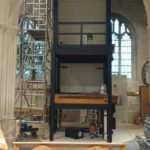 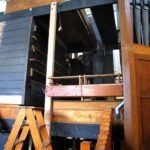 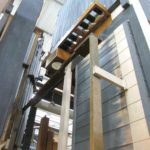 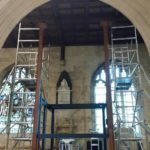 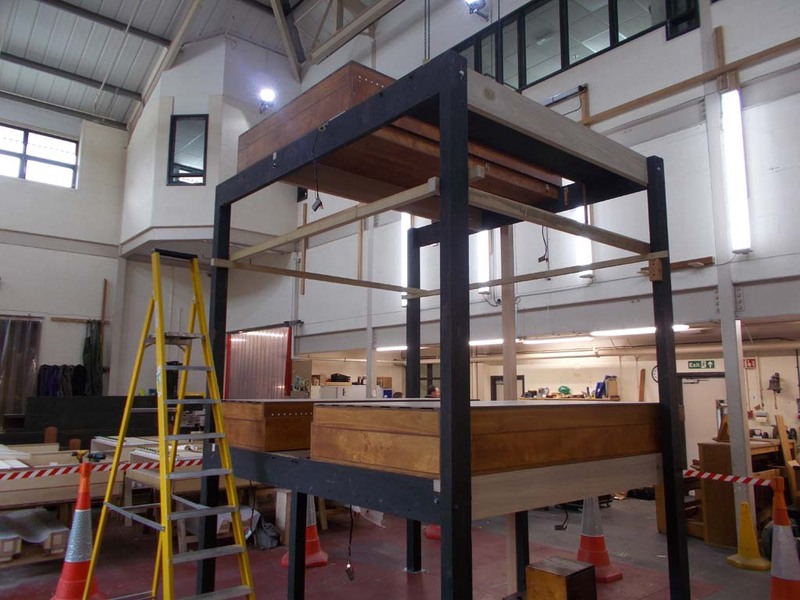 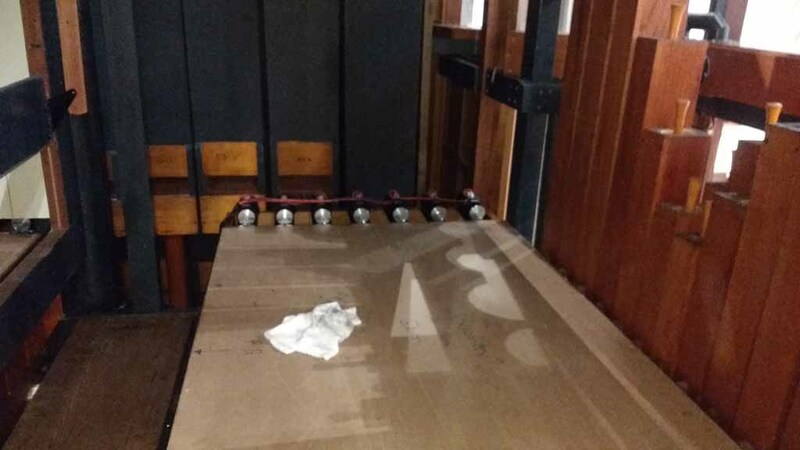 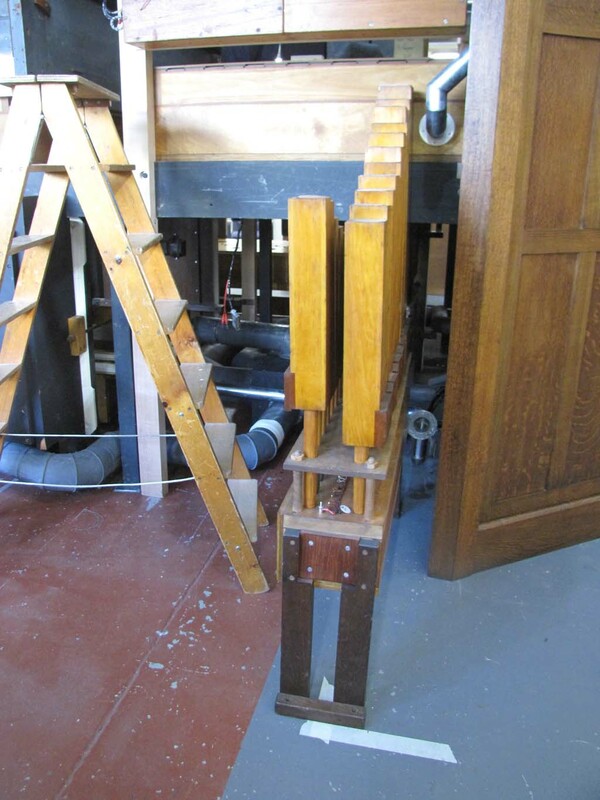 In order to ensure safe maintenance, new ladders and a safety rail will be provided for safe access to the upper level. 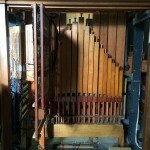 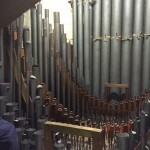 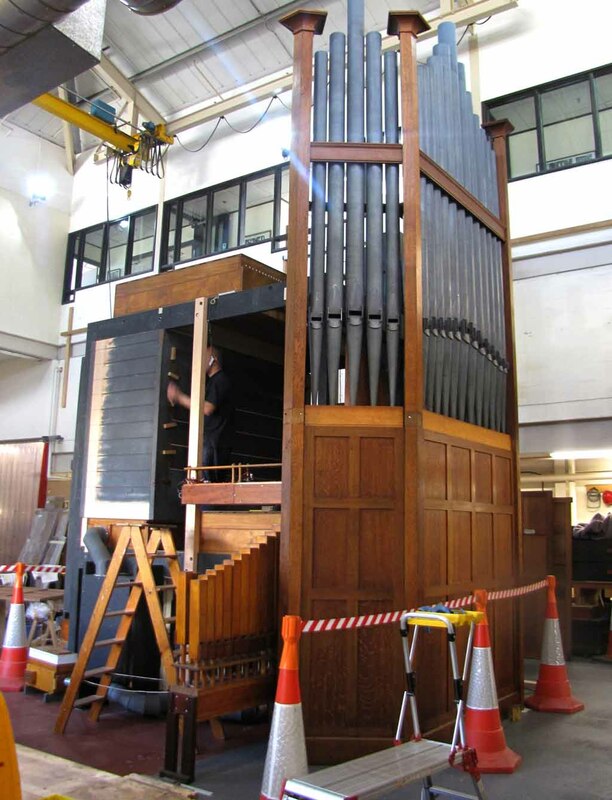 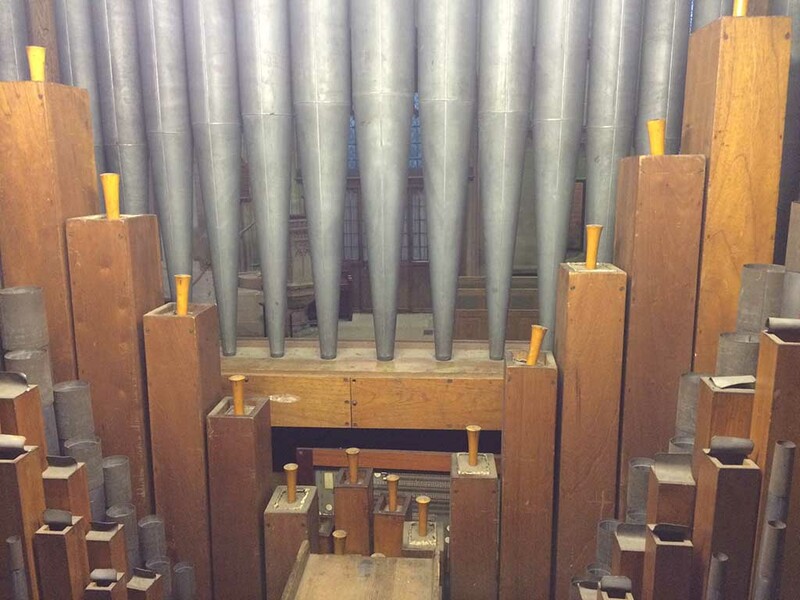 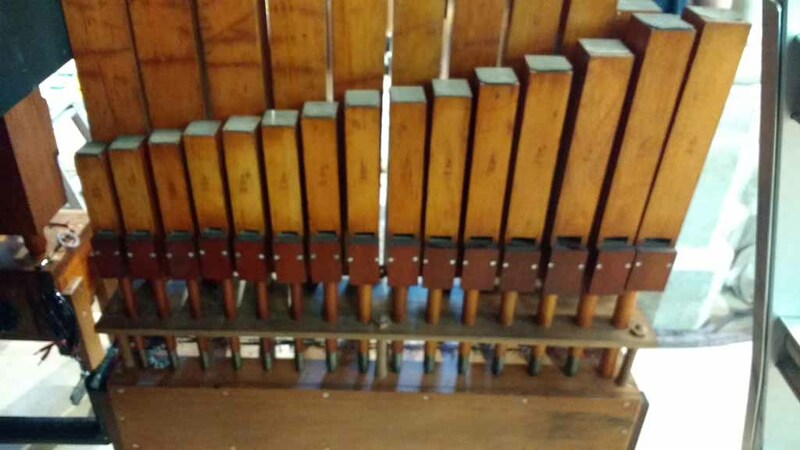 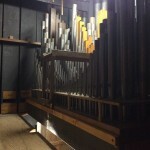 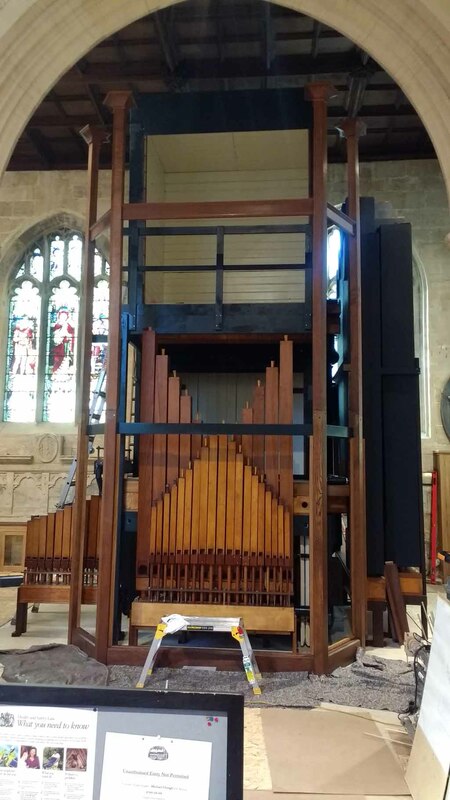 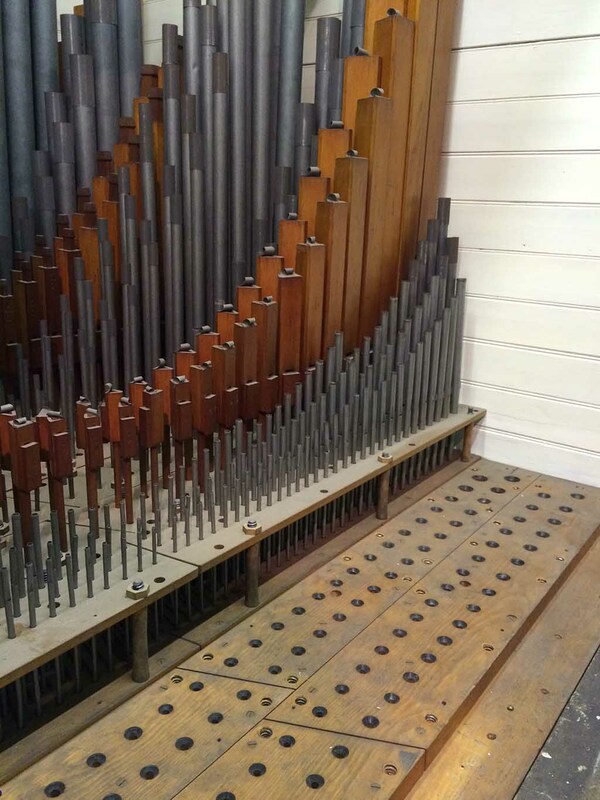 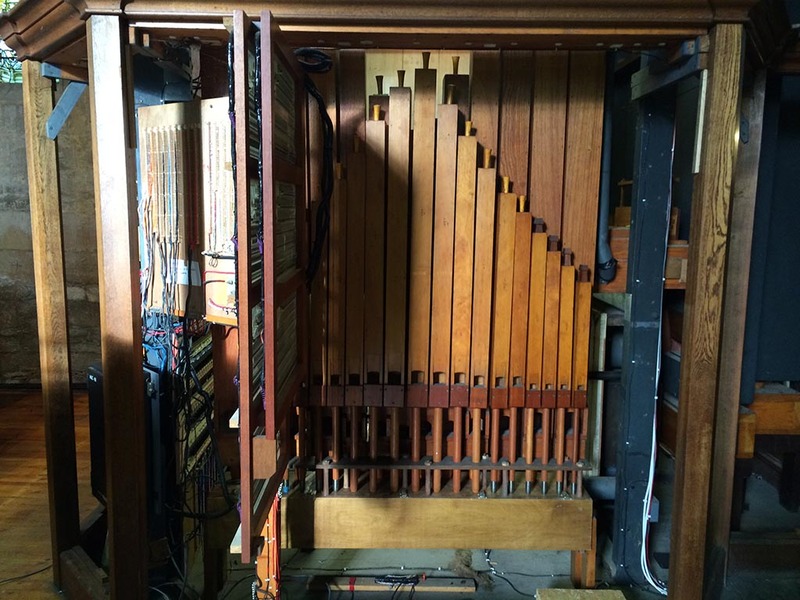 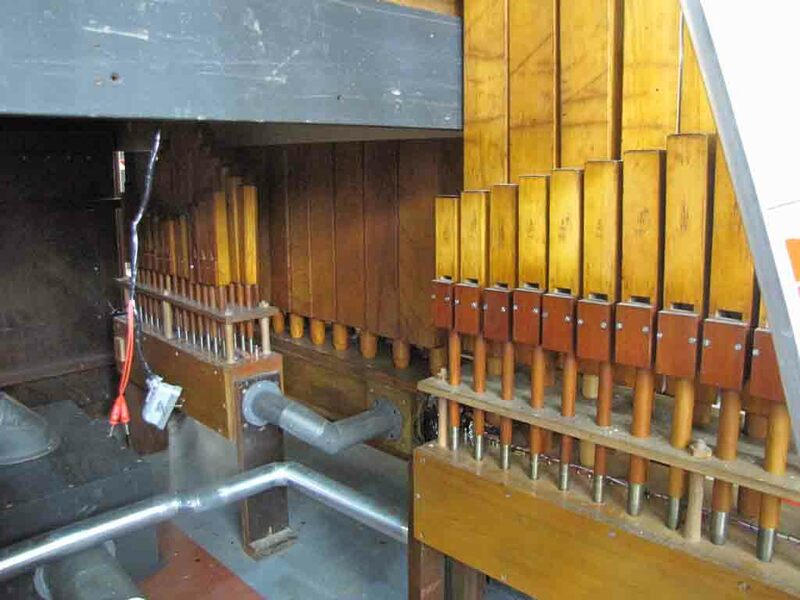 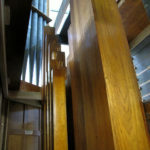 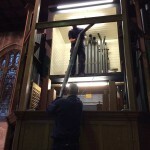 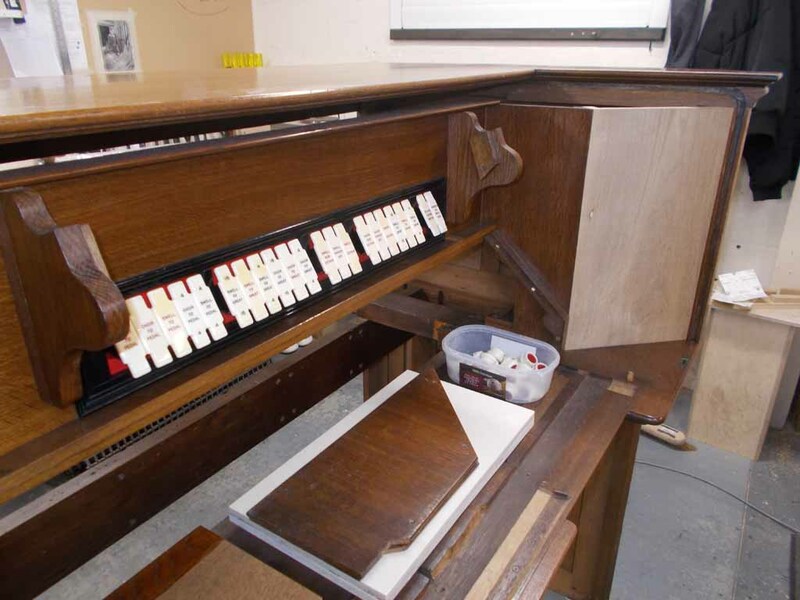 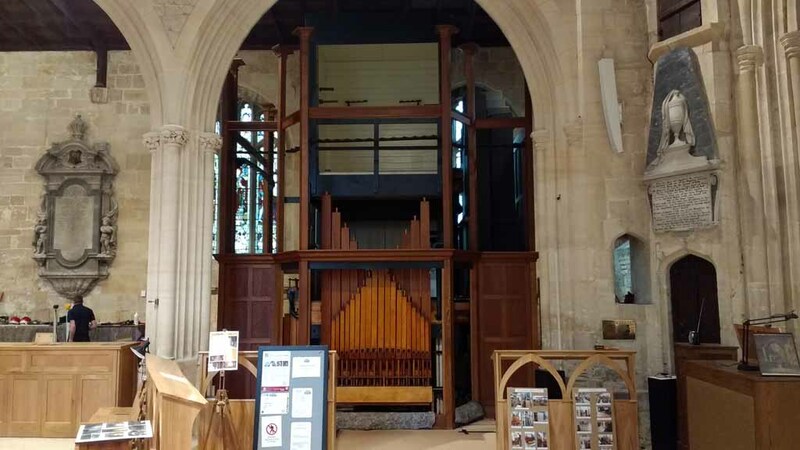 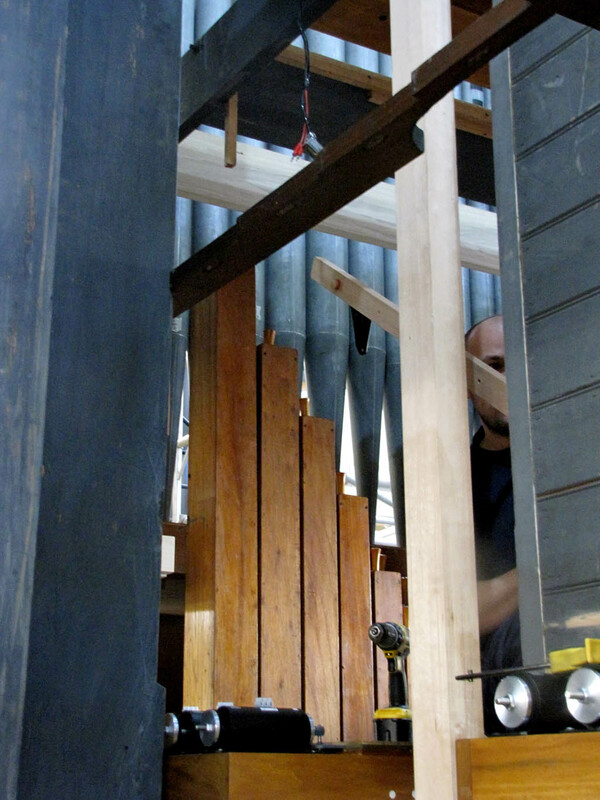 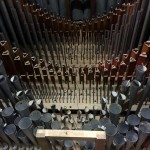 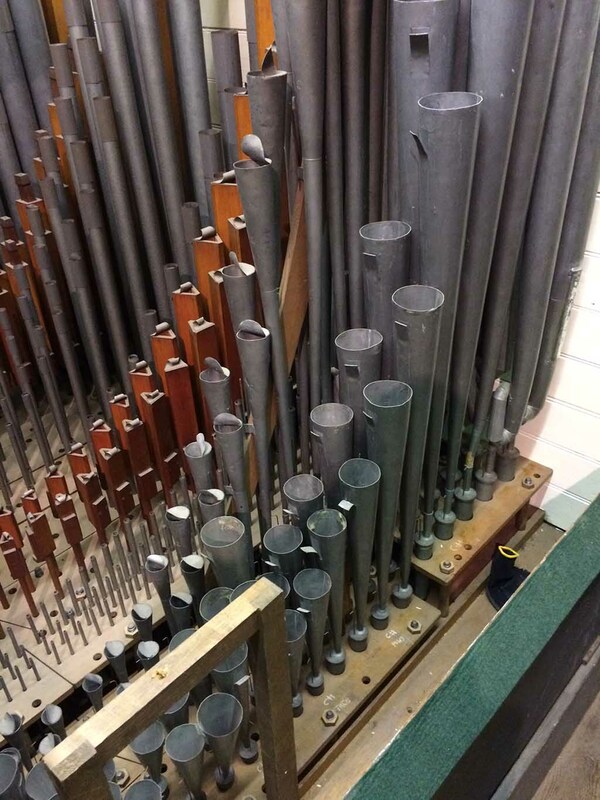 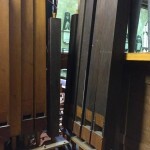 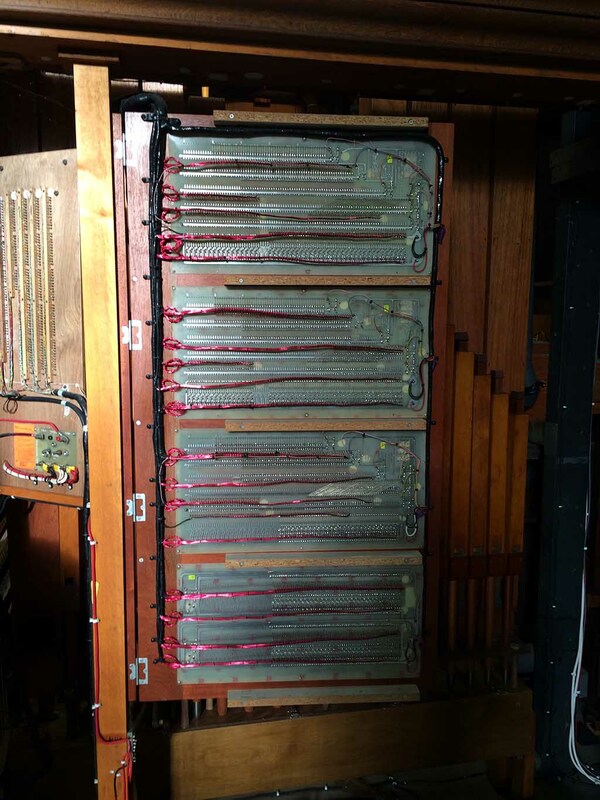 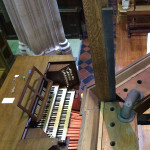 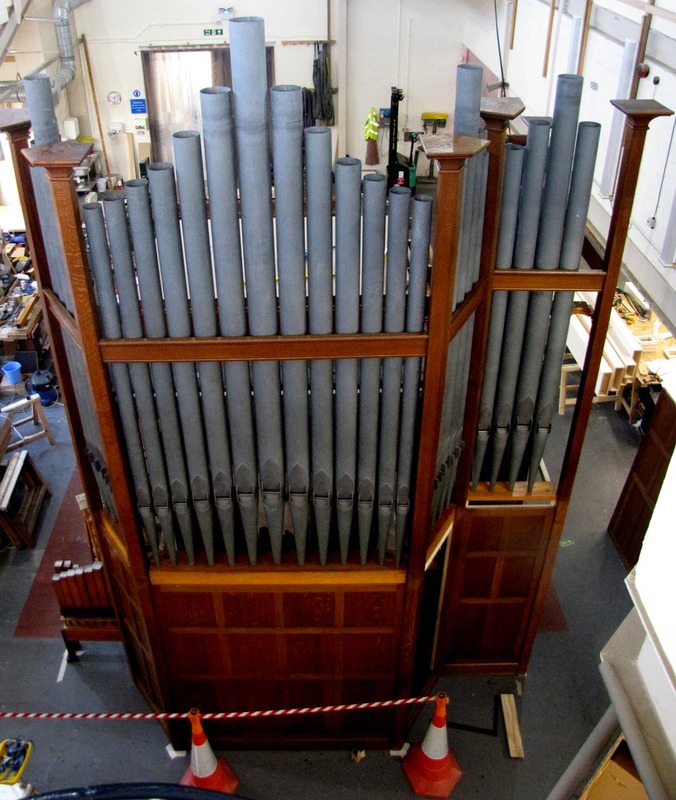 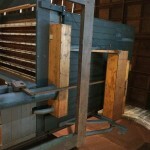 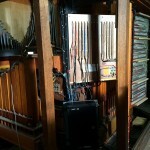 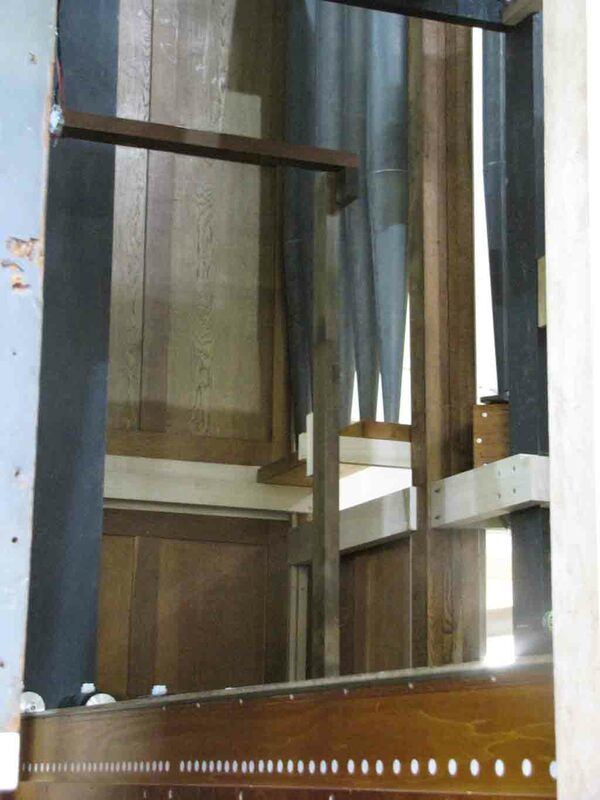 Details of the organ’s layout will be adjusted where necessary to accommodate any changes, but the principles of the original layout will be maintained. 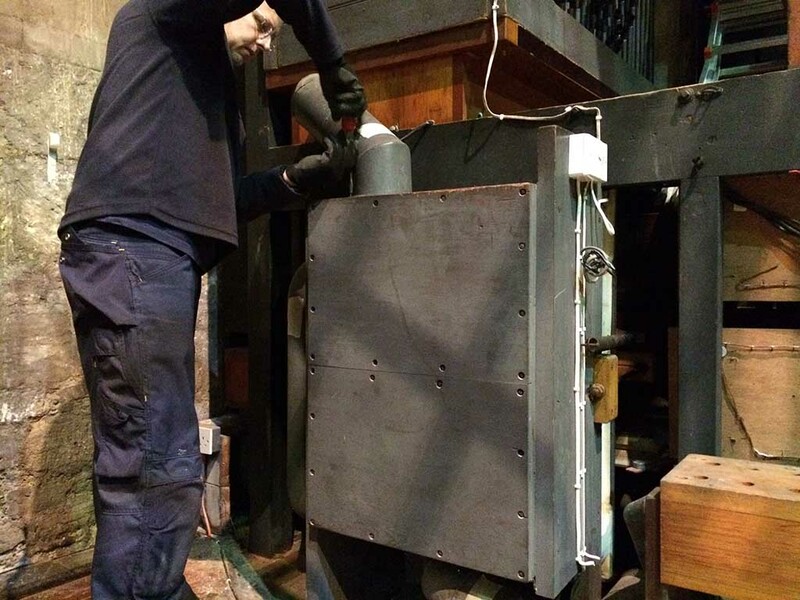 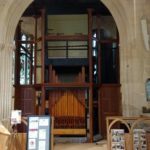 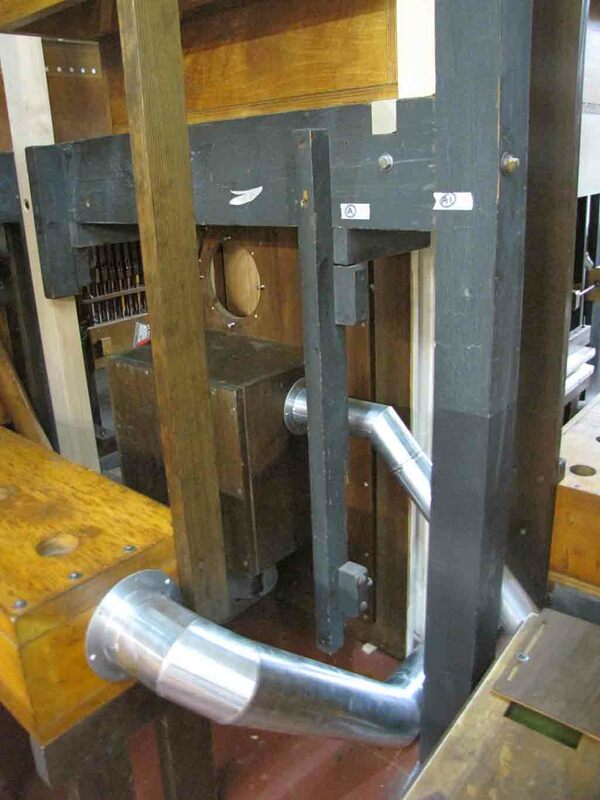 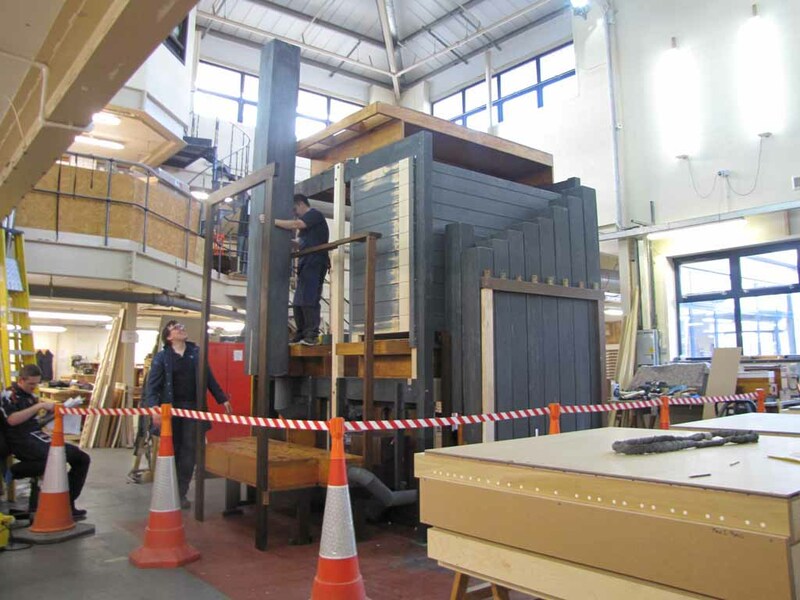 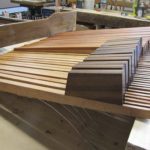 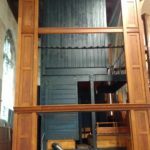 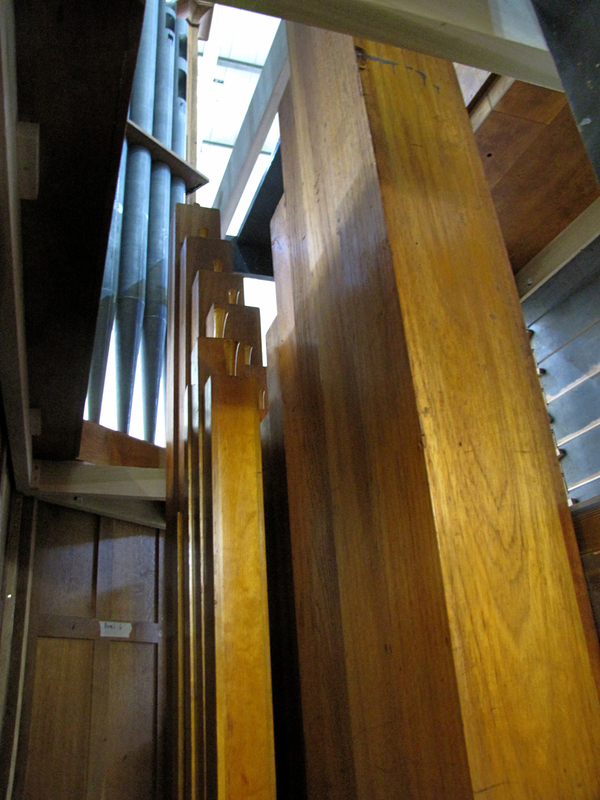 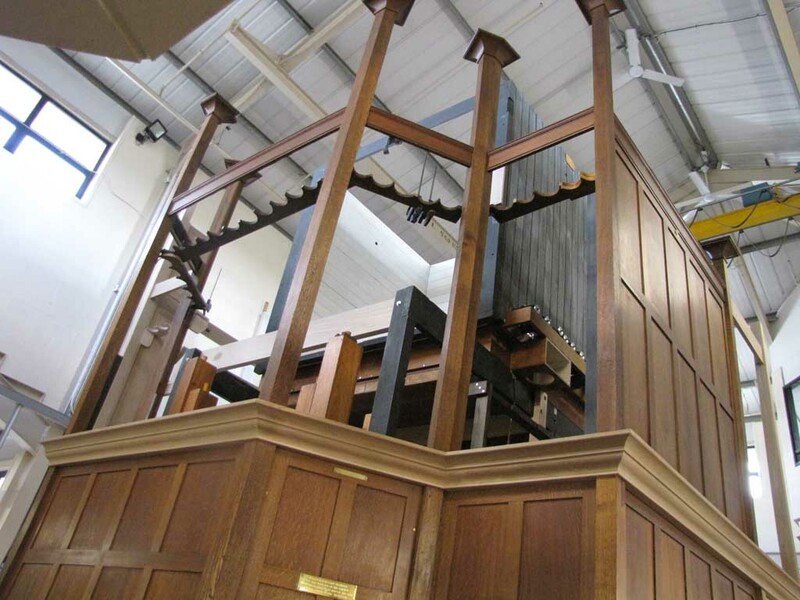 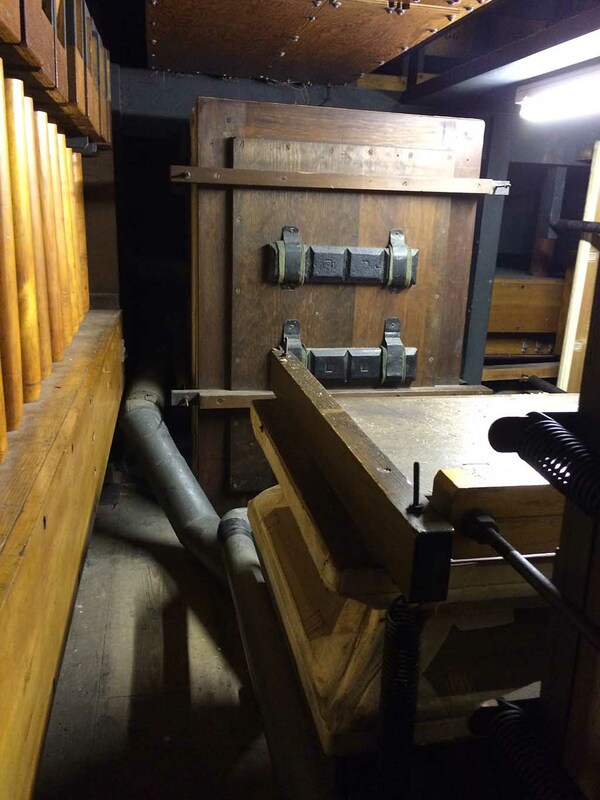 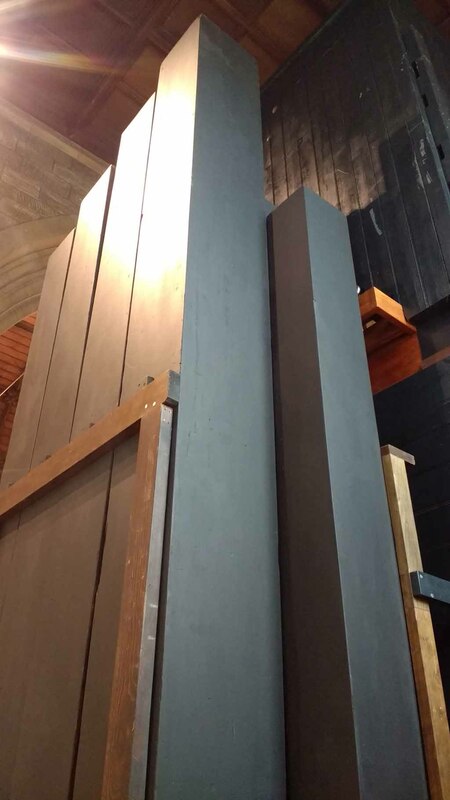 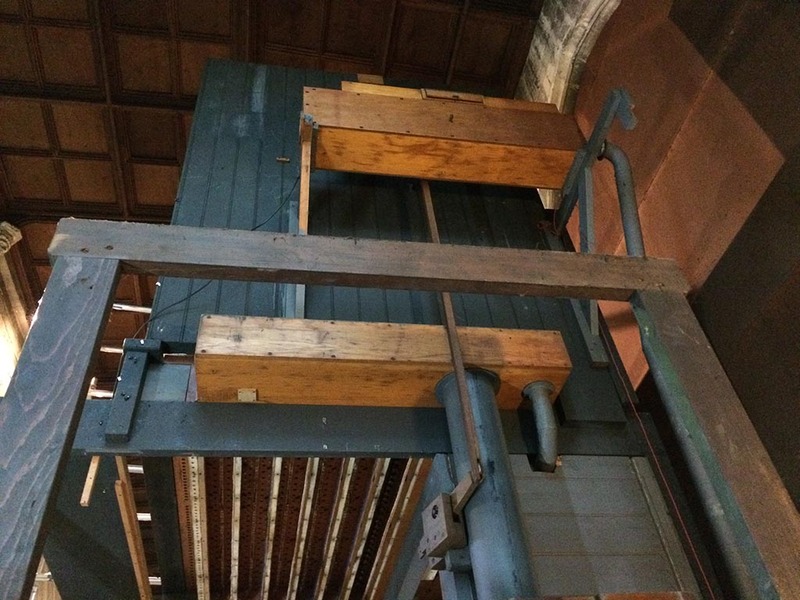 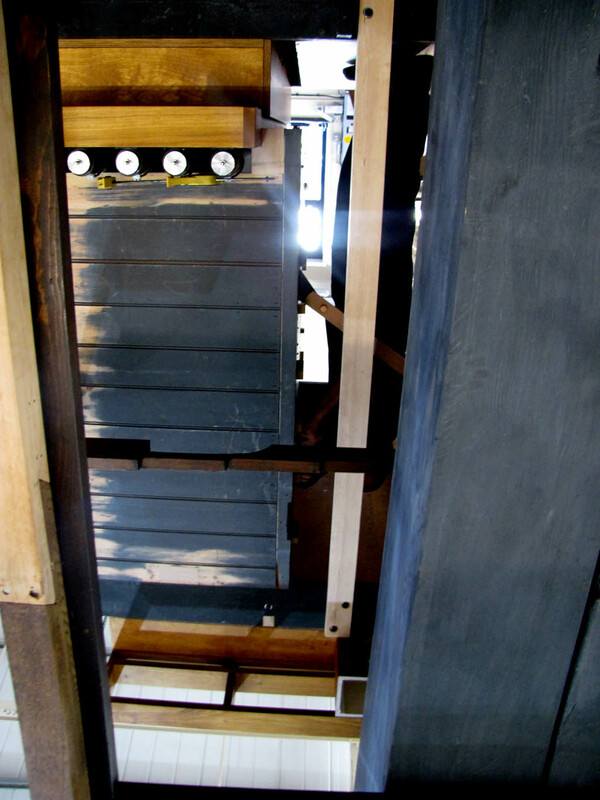 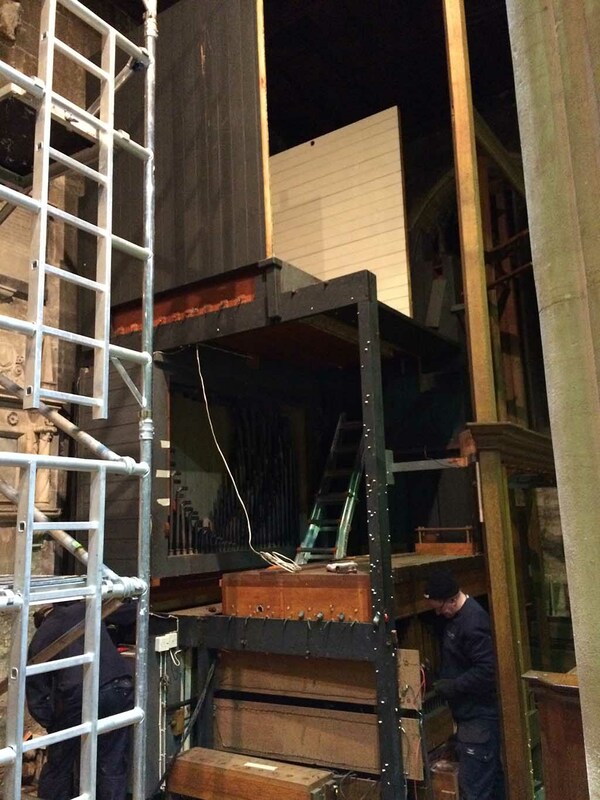 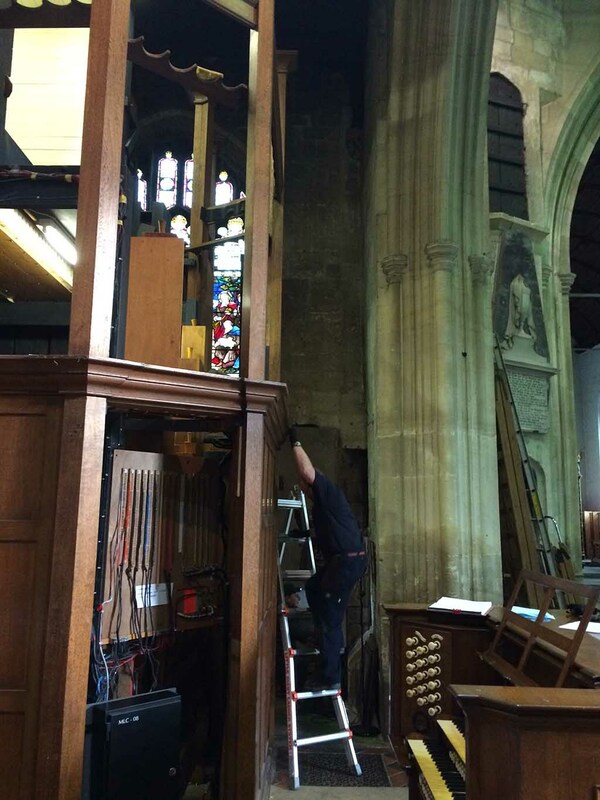 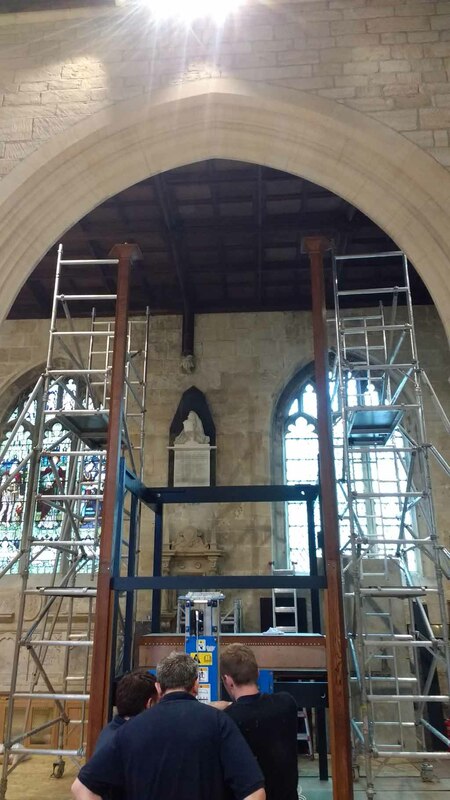 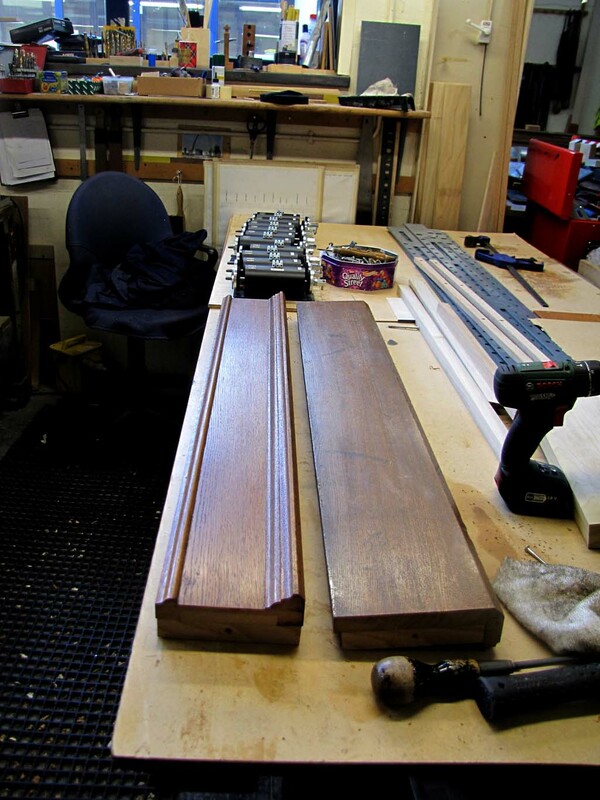 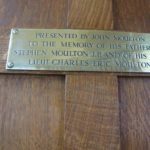 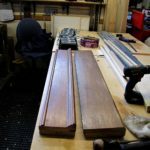 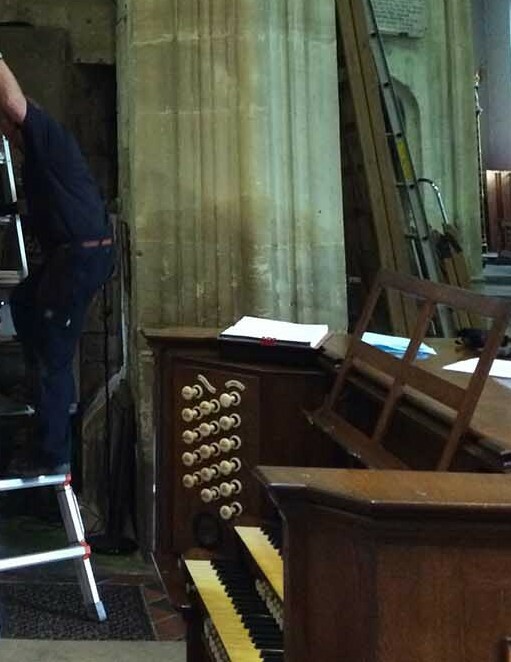 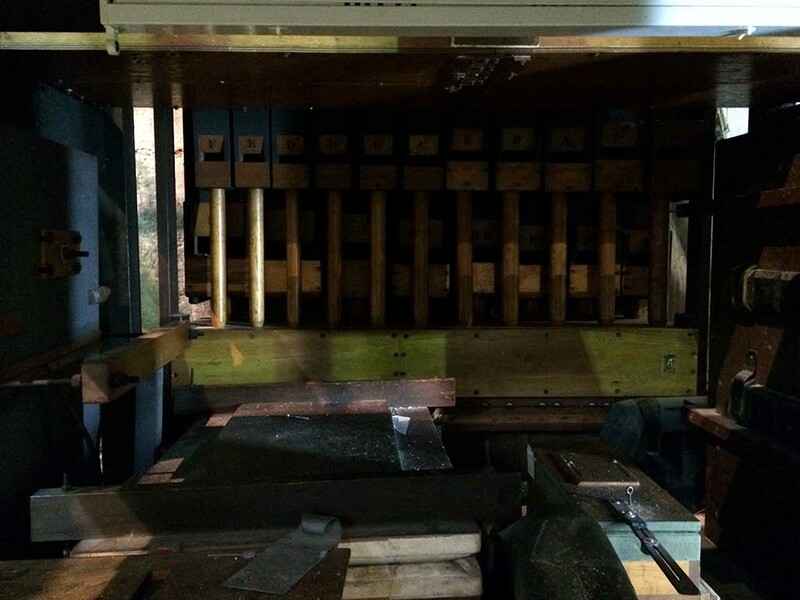 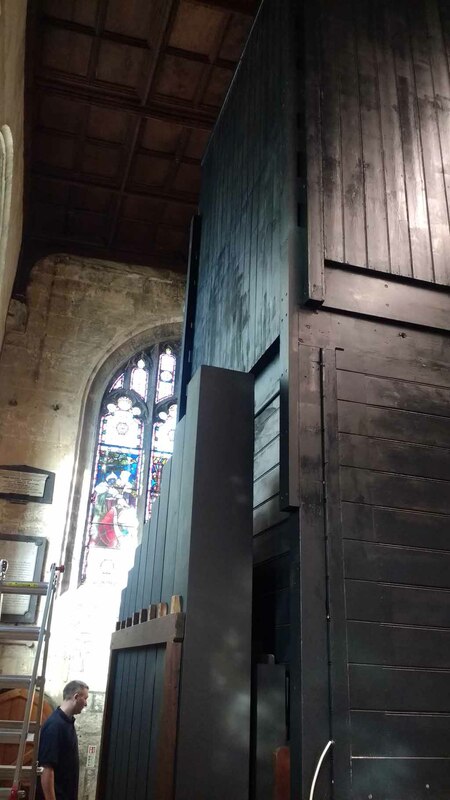 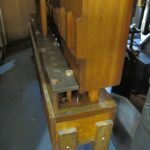 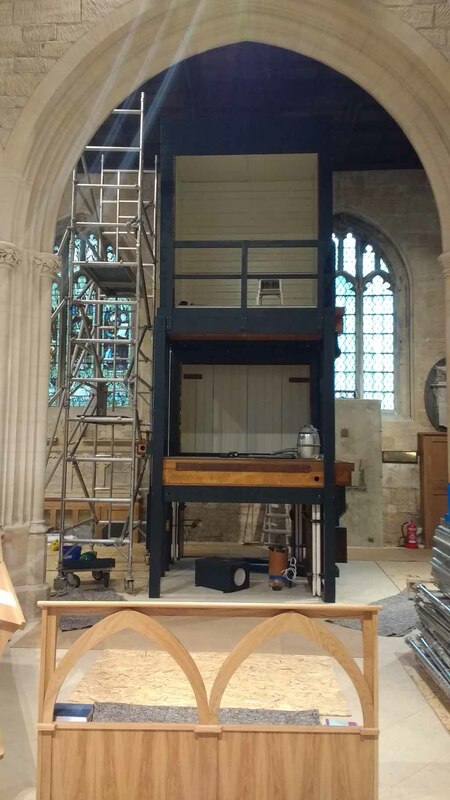 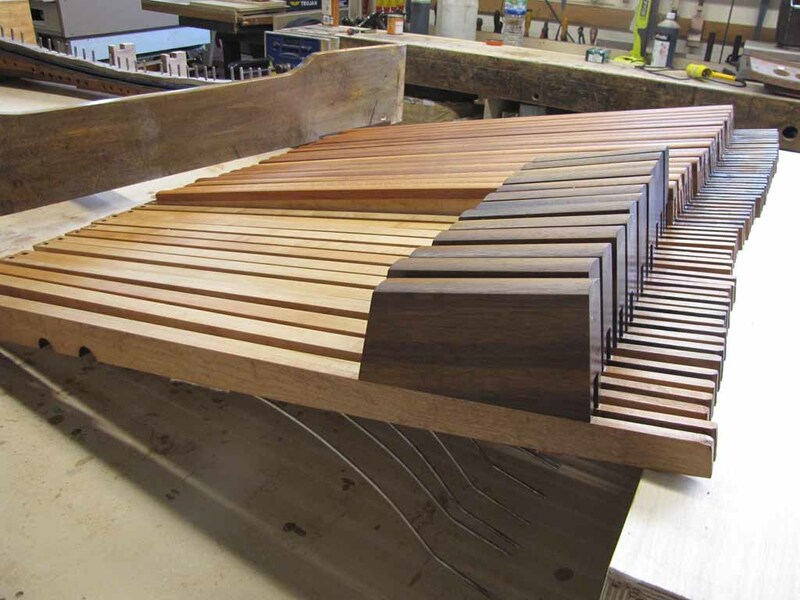 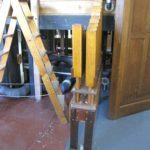 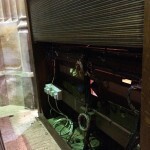 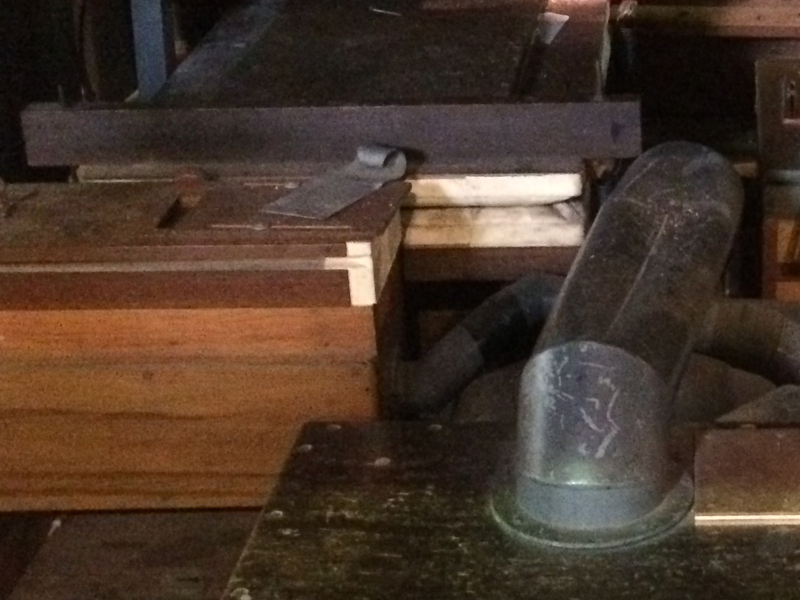 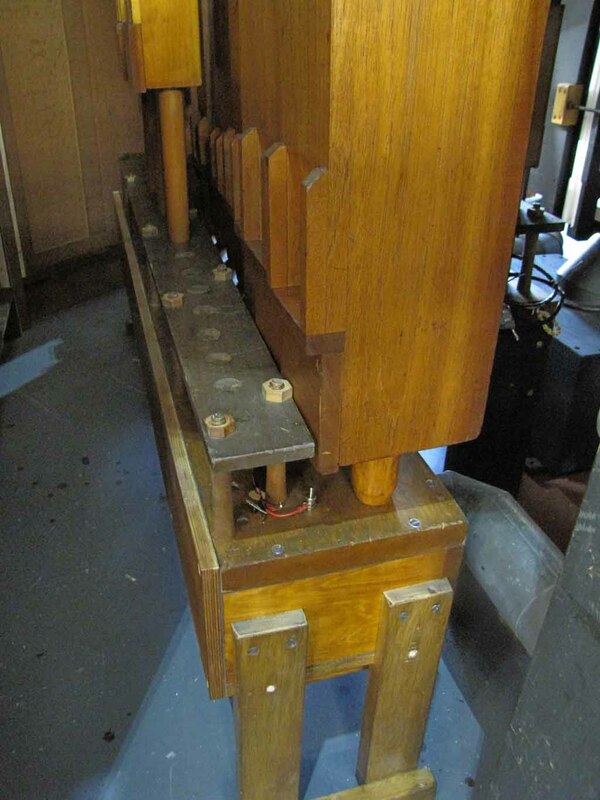 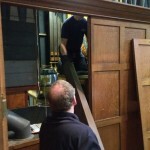 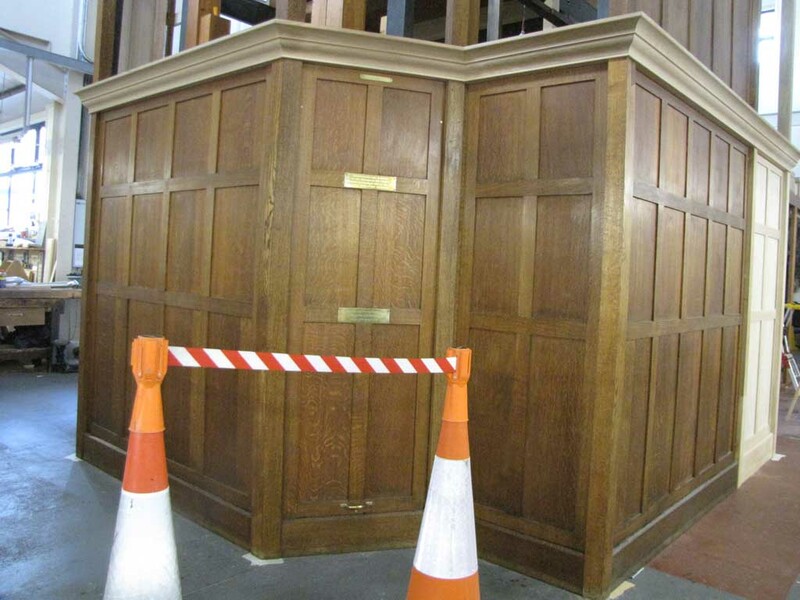 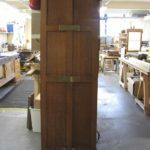 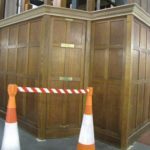 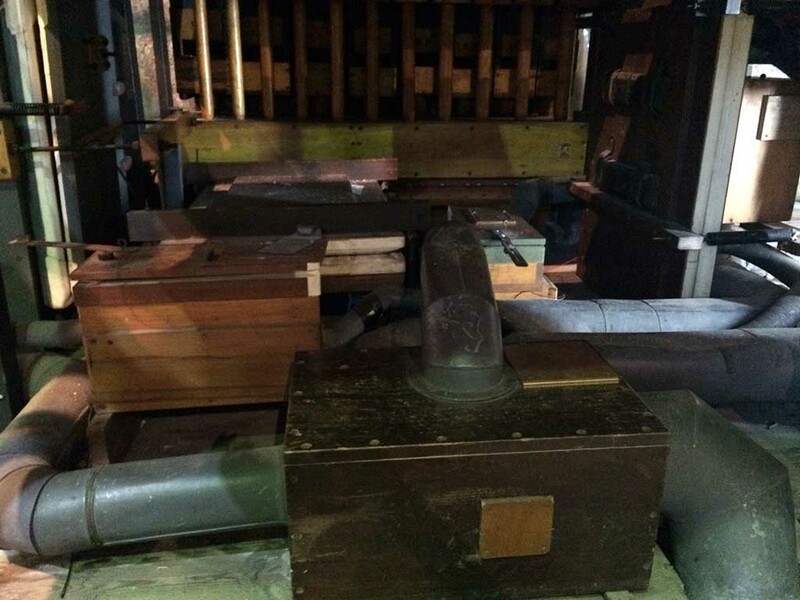 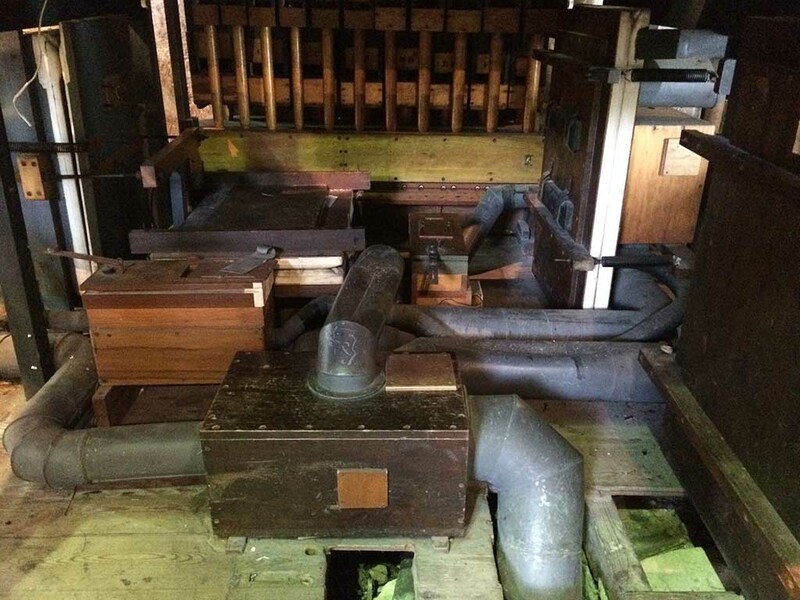 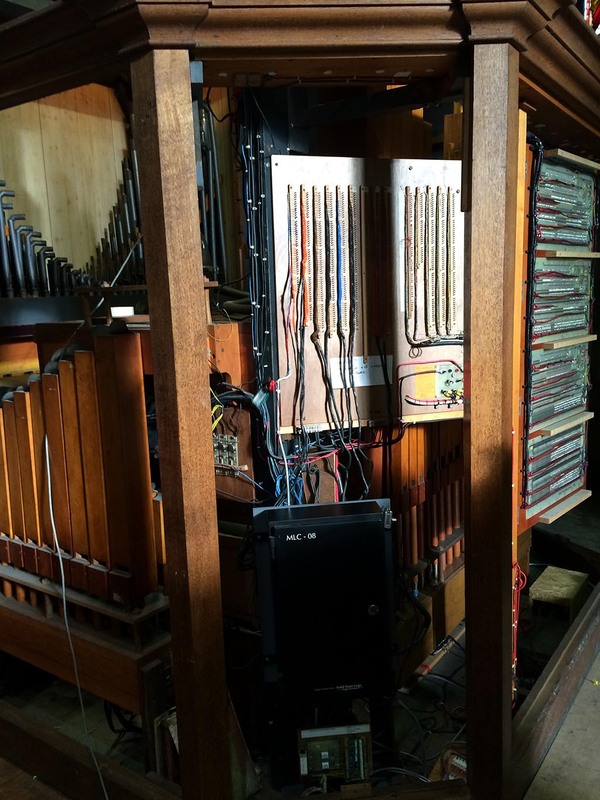 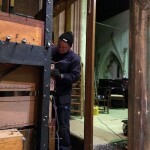 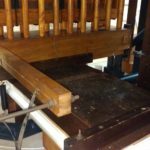 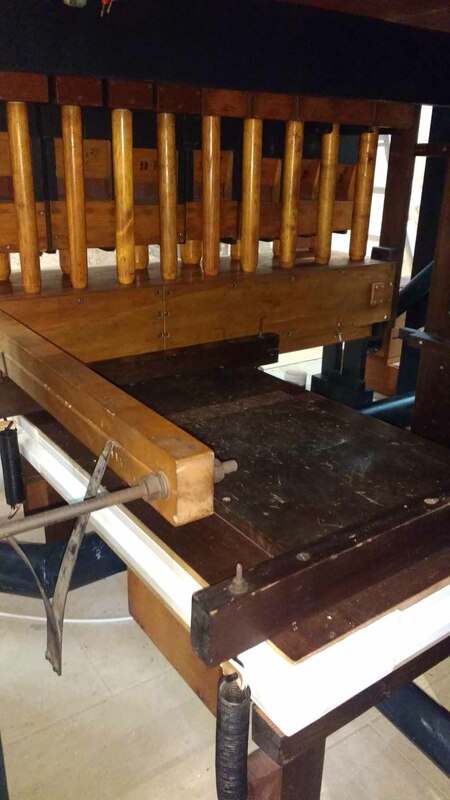 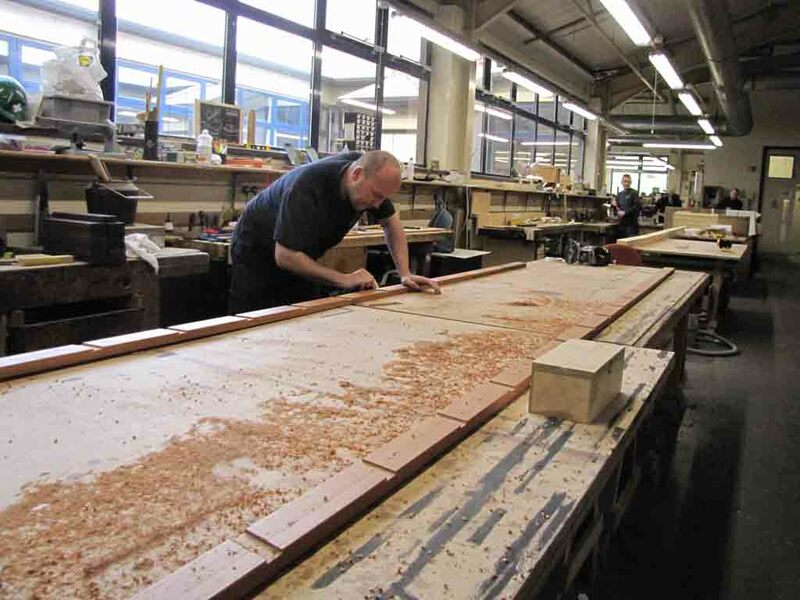 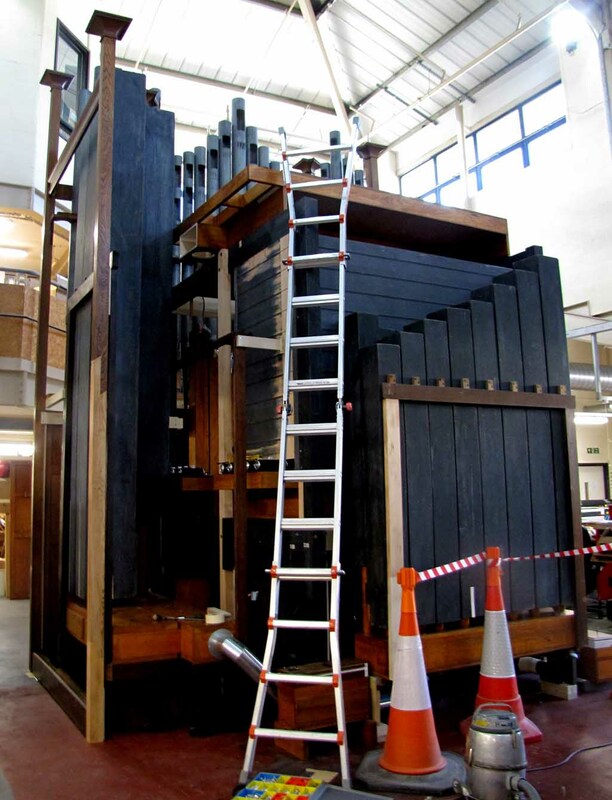 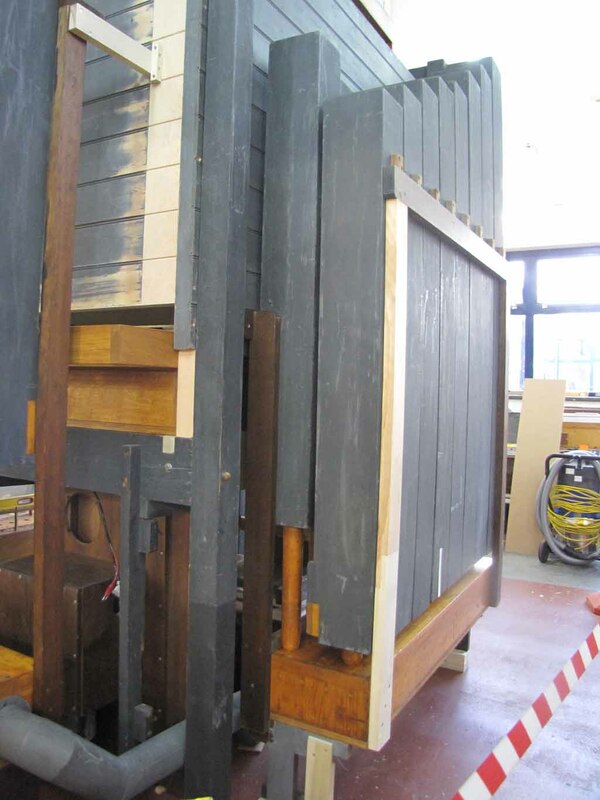 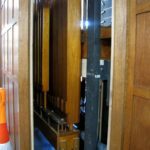 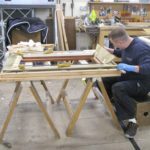 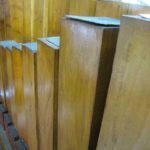 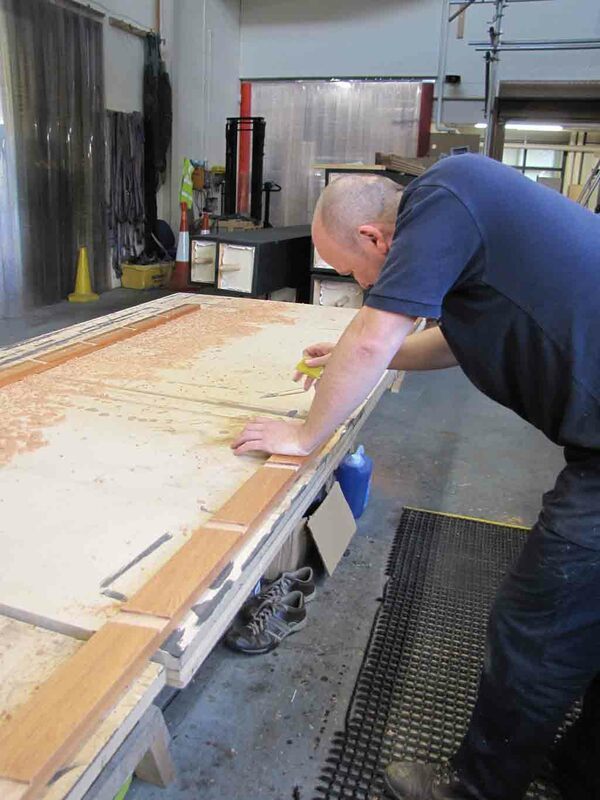 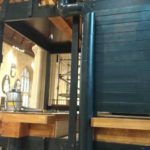 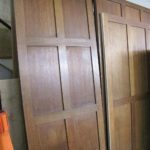 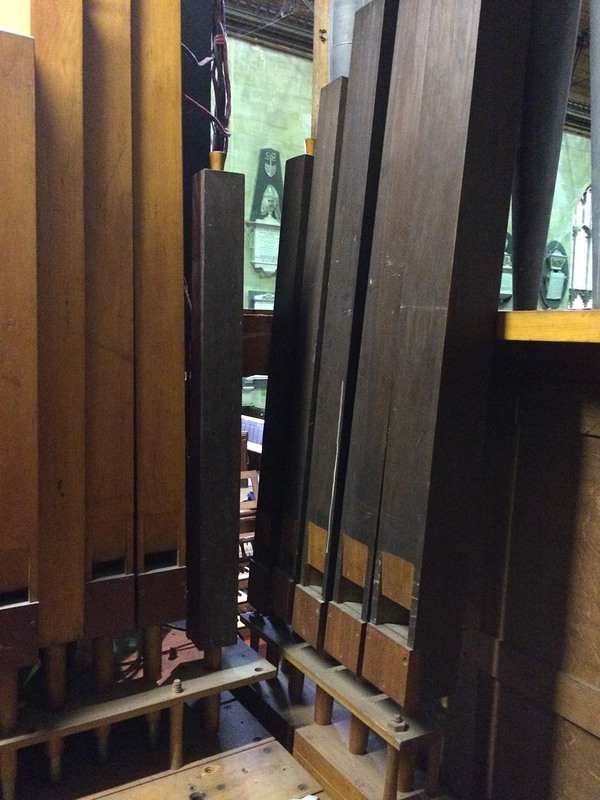 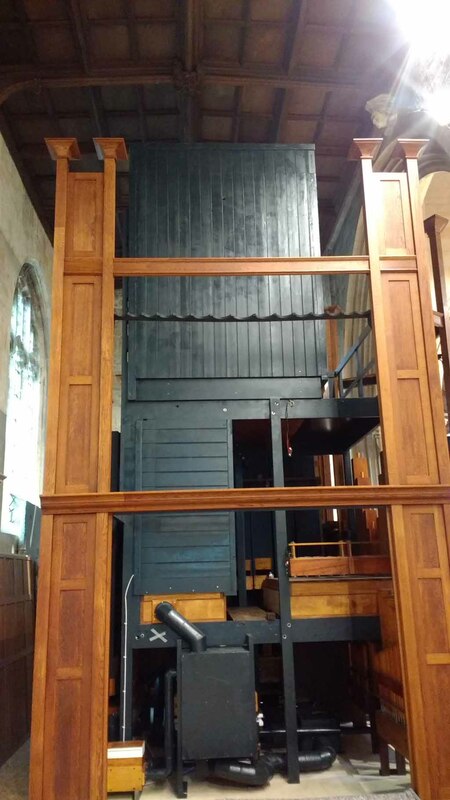 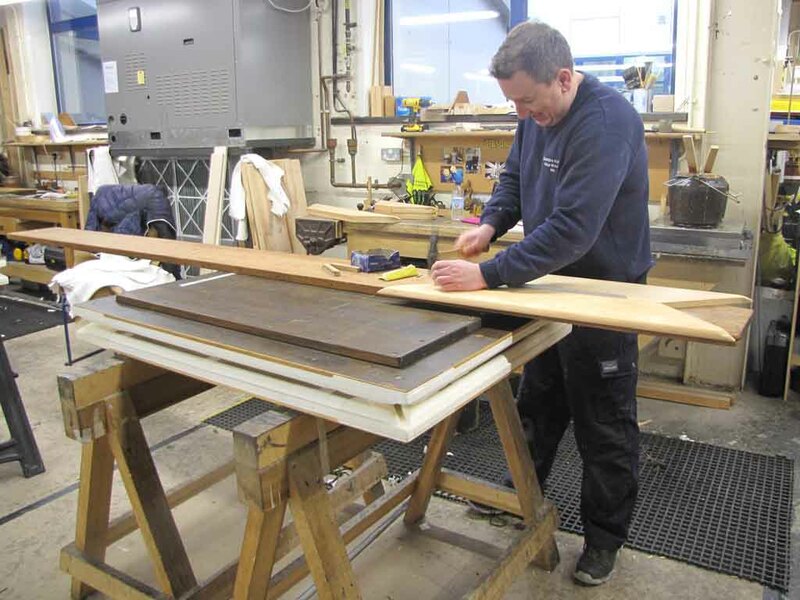 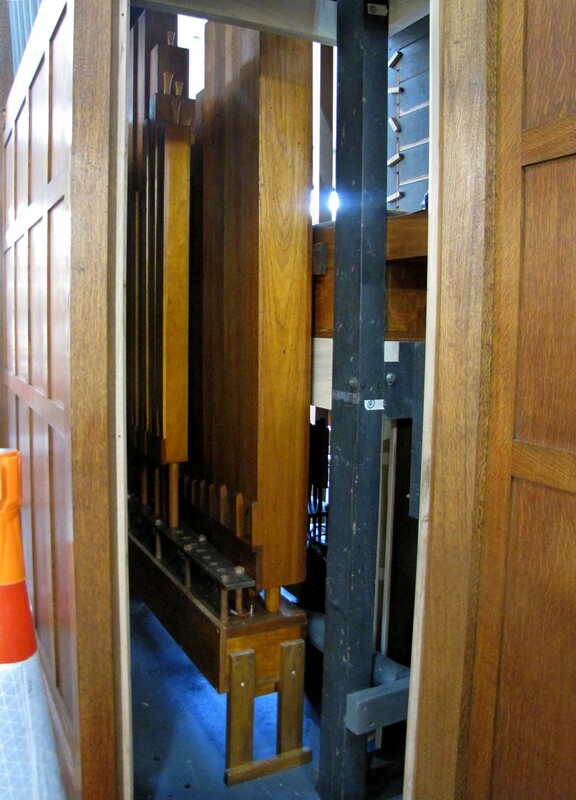 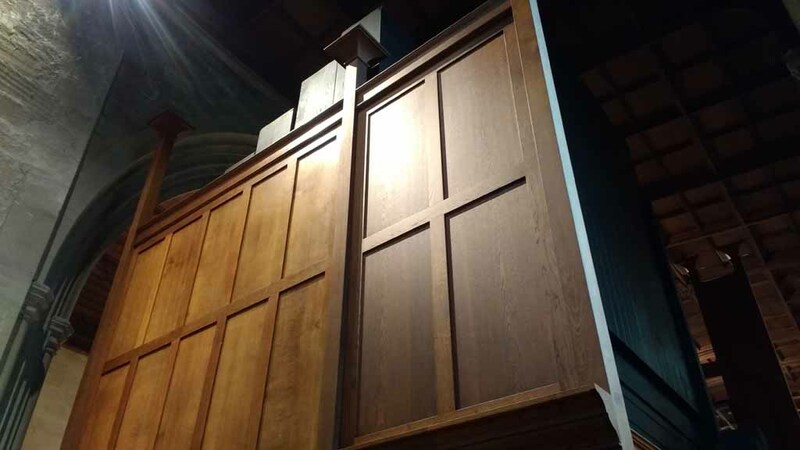 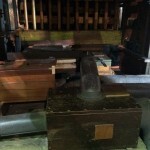 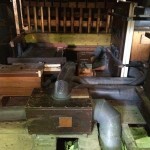 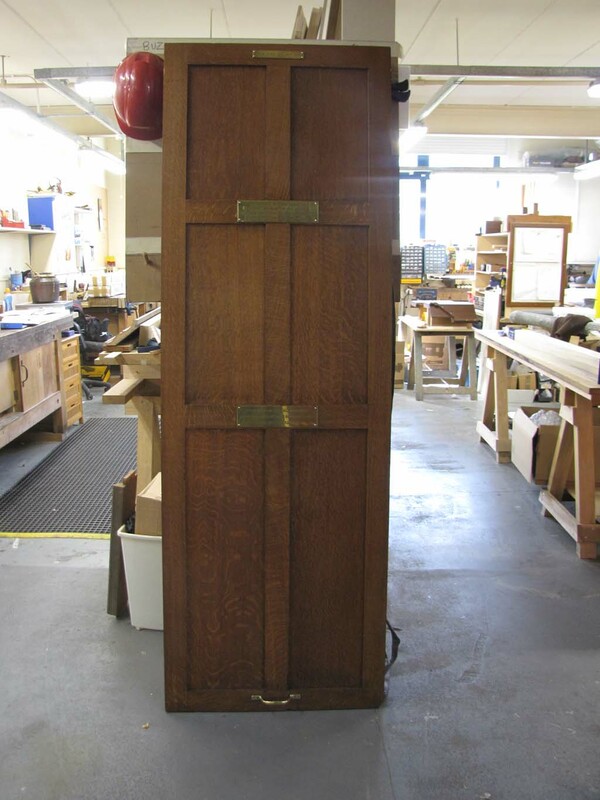 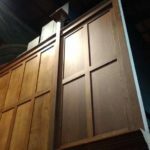 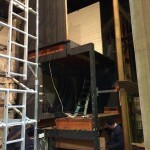 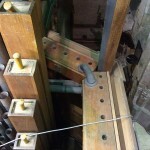 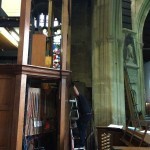 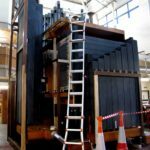 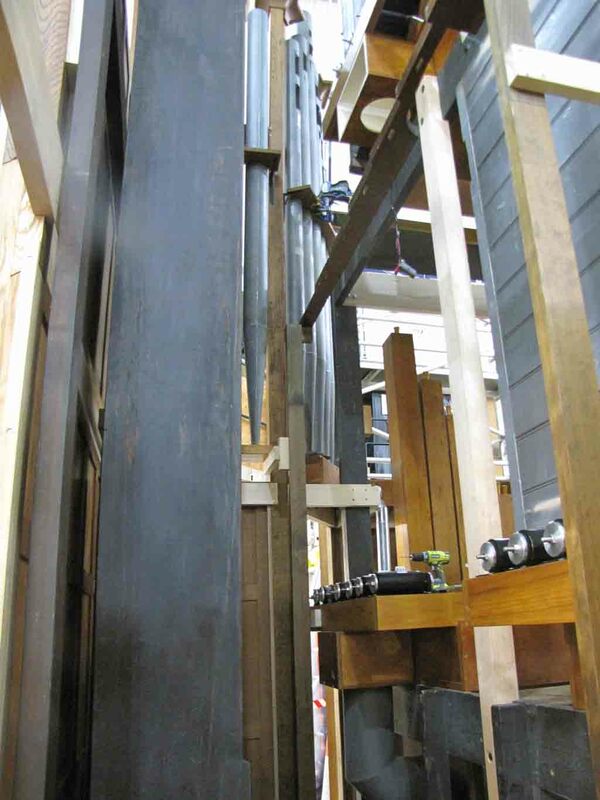 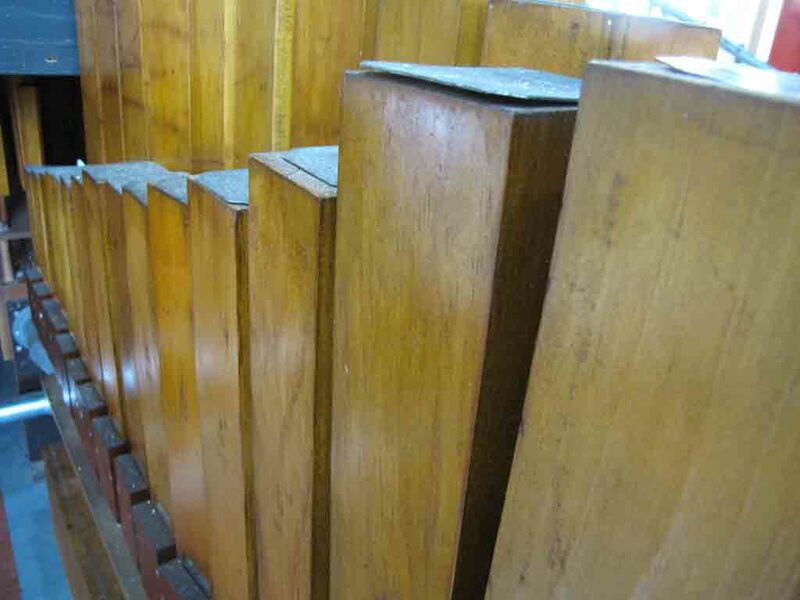 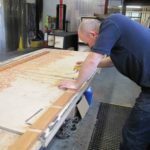 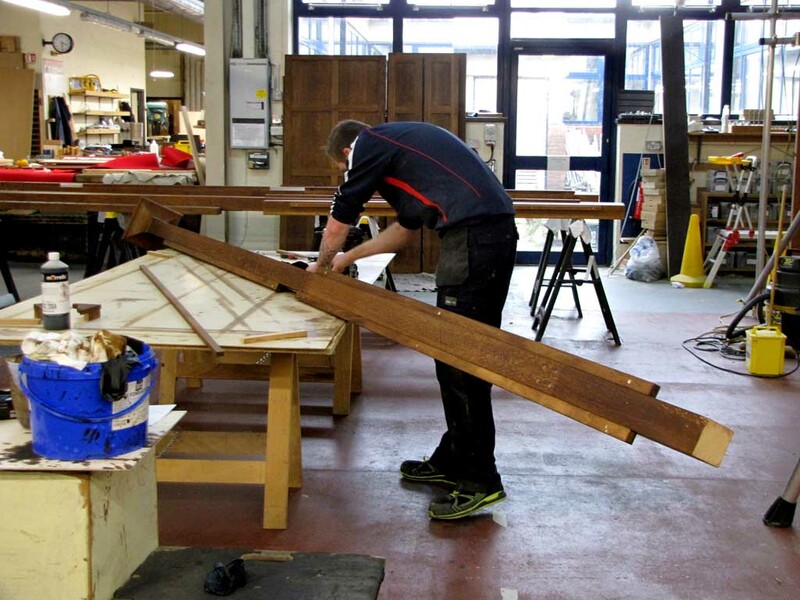 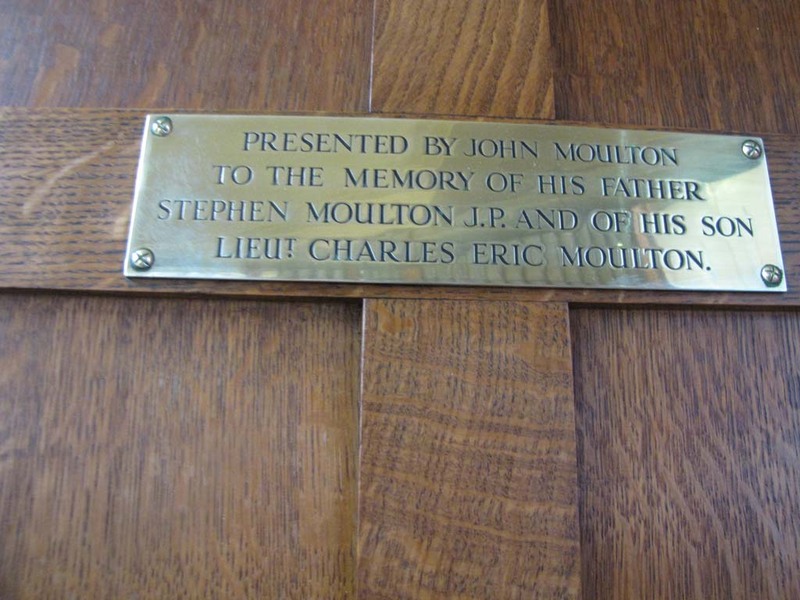 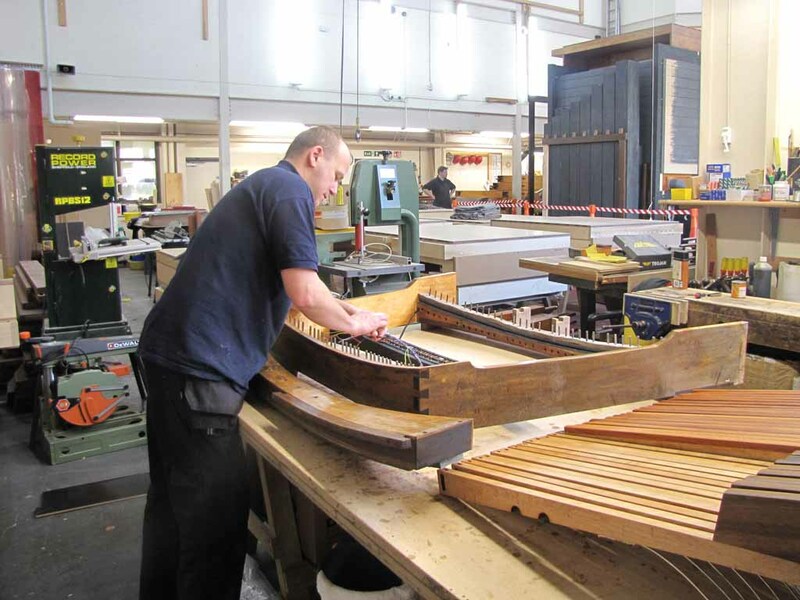 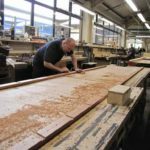 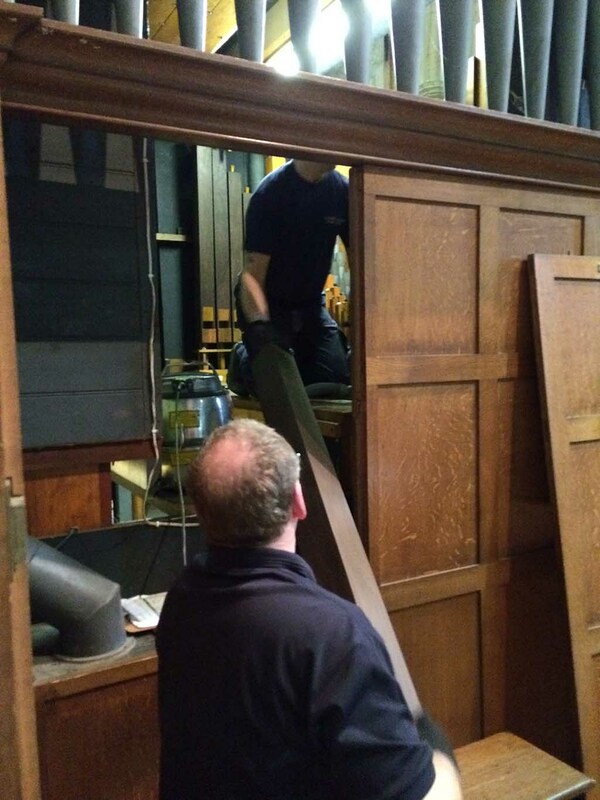 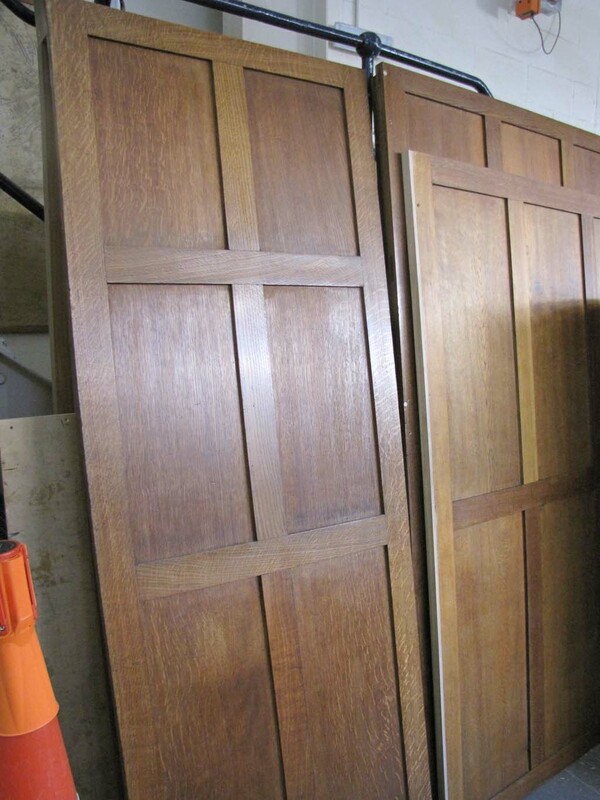 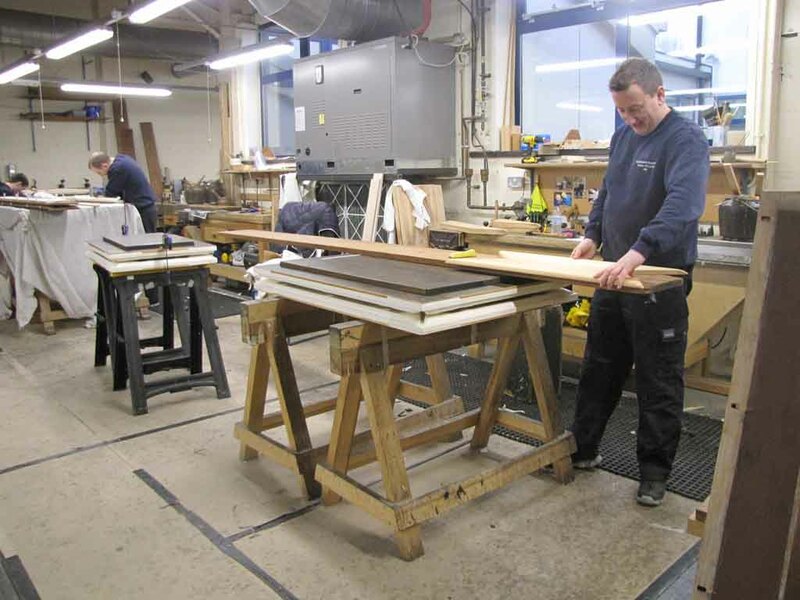 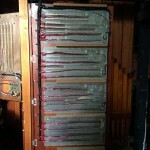 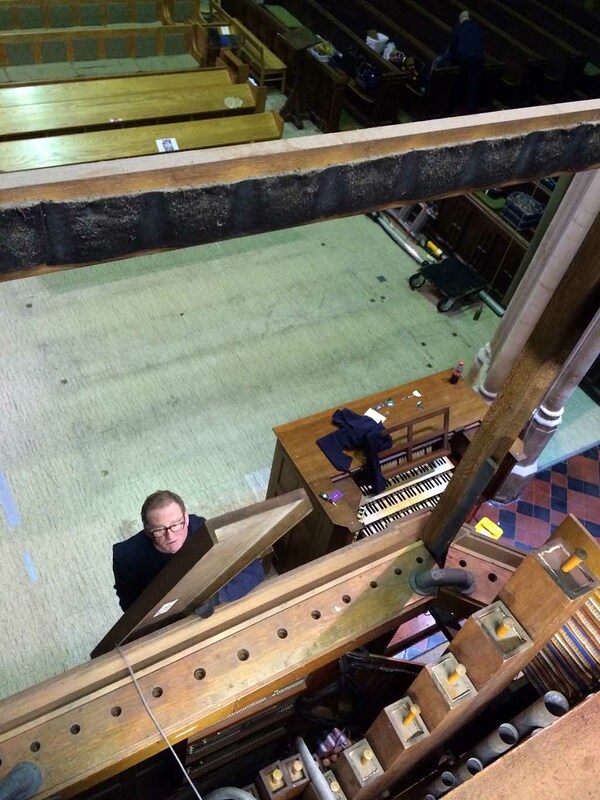 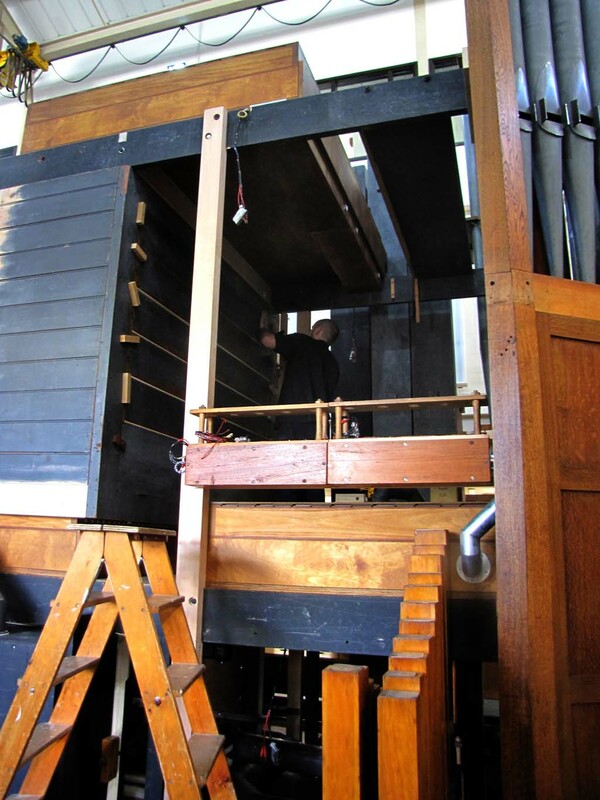 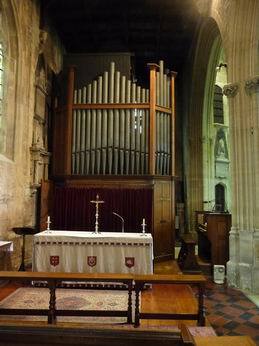 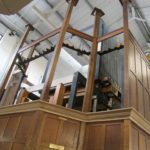 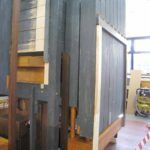 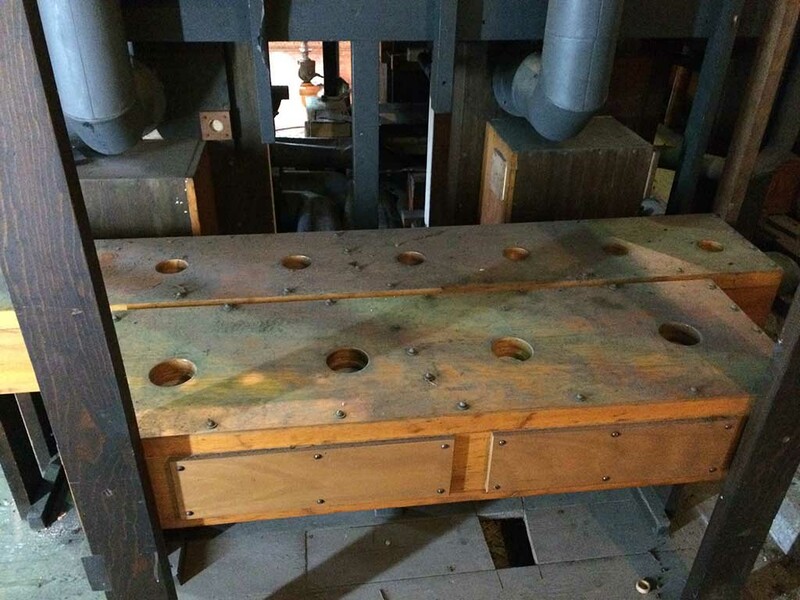 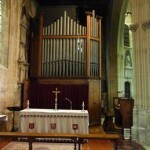 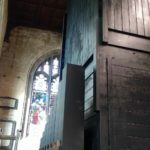 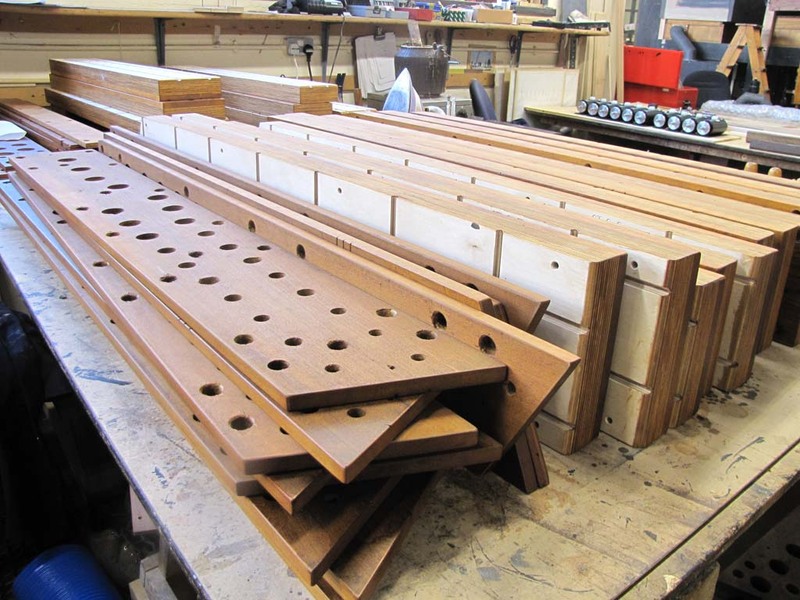 The Swell shutters will be overhauled; a new shutter front will be built for the Choir Organ, to improve the output. 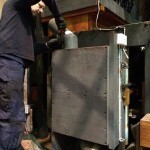 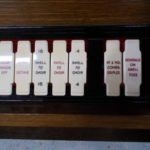 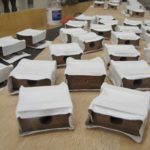 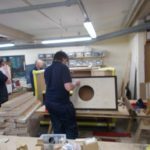 All parts of the mechanism will be regulated, leaving the instrument in first-class working order.